Juneuary 16-26, 2014, Rainier, 10K to Bridge CORN! I originally wrote a combined trip report for just the first 2 of these days, but didn't quite finish it enough to post it before heading back for more runs this week. So I decided to just include the subsequent days too. I've never tried to combine 7 separate trips into a single trip report -- we'll see how it goes . . . Taking full advantage of nearly 2 weeks of high pressure and sunny weather following the first major storm cycle of the 2013-14 season (January 7-14), I unexpectedly skied 7 times in an 11-day period (with a total of nearly 30 different ski partners) from above 10000 ft on Mount Rainier down to Nisqually Bridge at 3900 ft -- each time skiing over 6000 vertical ft in a single run with smooth sweet corn snow for the majority of the run and an easy exit on fully consolidated snow out to the bridge. Just WOW! Exceptional snow conditions and weather for January, almost like June in some ways, but perhaps even better: the low-angle midwinter sun prevents oversoftening of the snowpack, being too weak to penetrate the solid thick surface crust except perhaps on the steepest south aspects, and so there's no mank and no instability or wet slide issues at these elevations. It's like fully consolidated summer corn conditions with smooth fast snow and near-zero avalanche hazard, but without the weeks of waiting for the snow to fully consolidate. Almost 45000 vertical ft of mostly great skiing for just over 34000 ft of total ascent, the car shuttle netting an extra 1500 vert of skiing each time for a total of 10500 vert of freebies over the 7 trips. 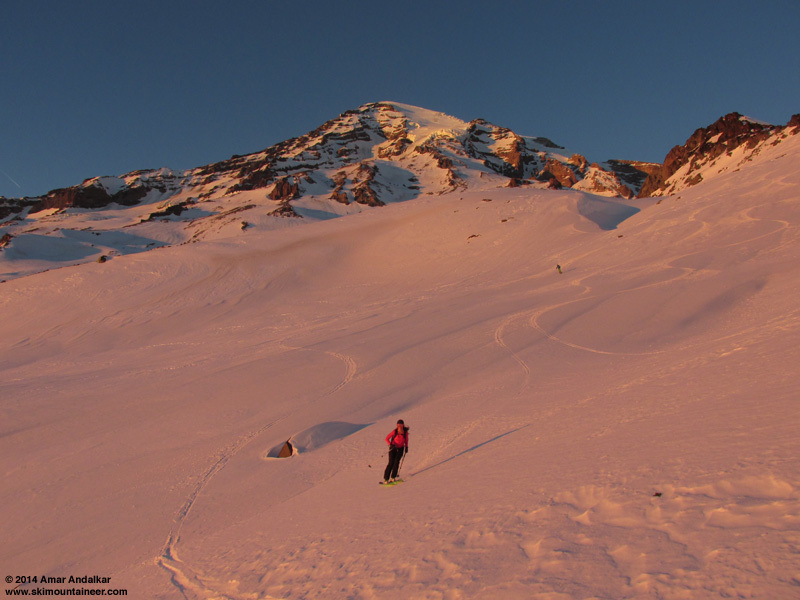 Skiing smooth corn at sunset on the Van Trump Glaciers, January 16. 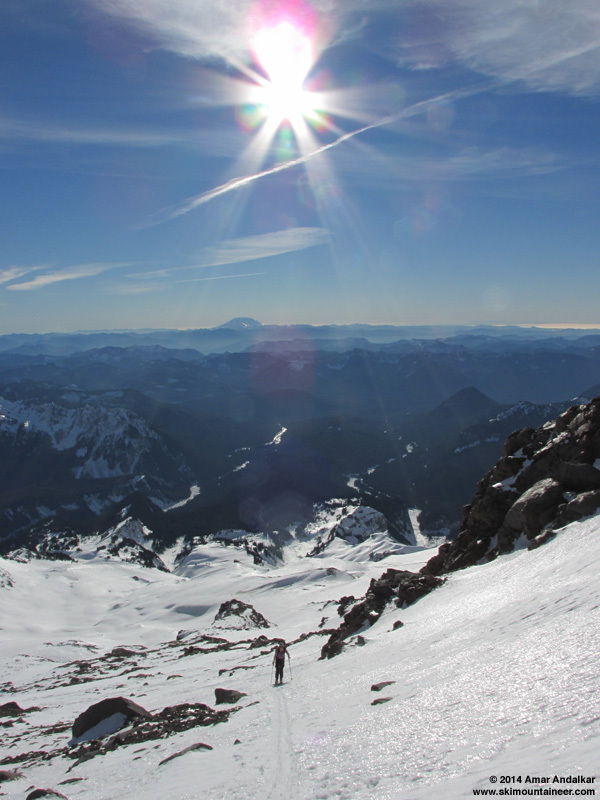 I wanted to ski from the summits of Mounts Hood and Saint Helens and Adams and Baker too during this high pressure, instead of repeating runs on Rainier so much, but partners and freezing levels and access and circumstances did not come together for those other peaks. 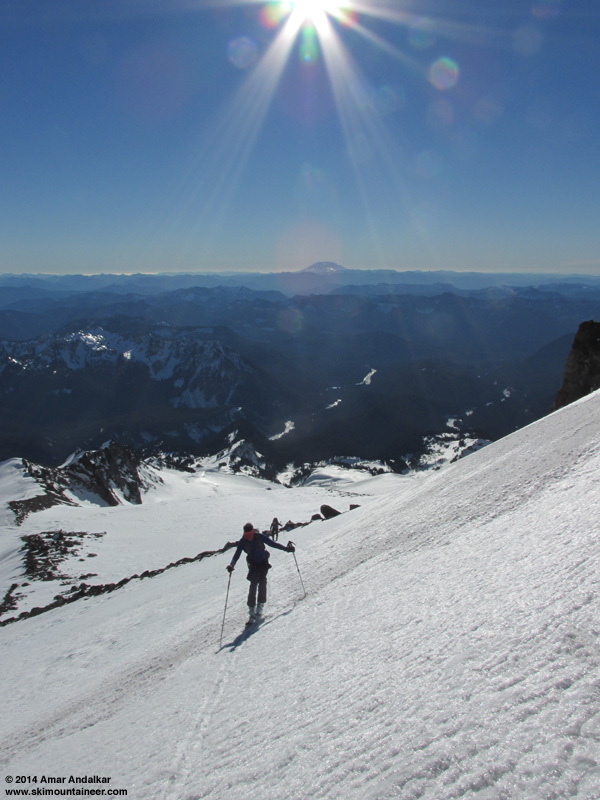 So it was back to Rainier by default again and again, where the goods were known to be great, resulting in the most concentrated period of ski mountaineering on a single mountain that I've ever done (in this case, only a single side of a single mountain). The freezing level also never quite rose high enough for me to be tempted into making a Rainier summit ski attempt this time, especially given that I already have a January summit-to-bridge ski descent in near-perfect conditions in 2009 -- snow conditions up high this time were marginal at best on the Ingraham Direct (its E and SE aspect makes it impossible for the sun to soften it during this time of year), and it was unknown if crevasse conditions on the upper Nisqually Glacier would allow the Fuhrer Finger or Thumb routes to connect to the summit (these face S and SW, with a reasonable chance of corning up to over 11000 ft under current weather and sun conditions). So instead, each of these trips would top out right near the typical freezing level of 10-11000 ft during this period, above which the snow remained solidly frozen, and below which almost every steep S or SW aspect was near-perfect corn snow. 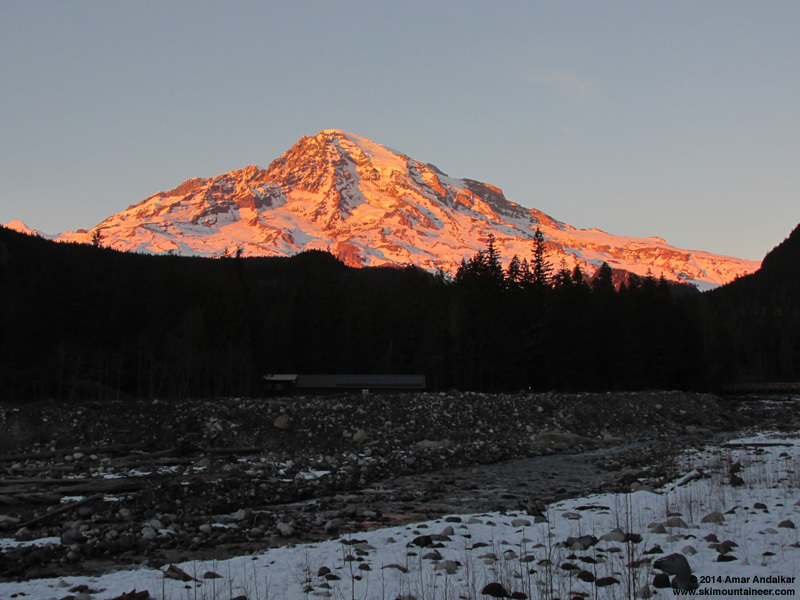 Sunset glow on the Mountain above the Nisqually River at Longmire, January 24. Thanks to my ski partners on these trips (Carl, Tara, Jeff, Rory, Jameson, Kam, Paresh, Kane, Phil, Jeremy, Khanh, Tim, Stephanie, Josh, and Alisa), and also to the other skiers who joined me on an impromptu basis for the 4 Nisqually Chute descents (Scott, Jason, Adam, Ron, Julie, Allen, Megan, Cam, Jeremy, Allison, Jordan, Andres, Mic, Kevin, ... hope I got your names right, sorry if I didn't or forgot anyone). 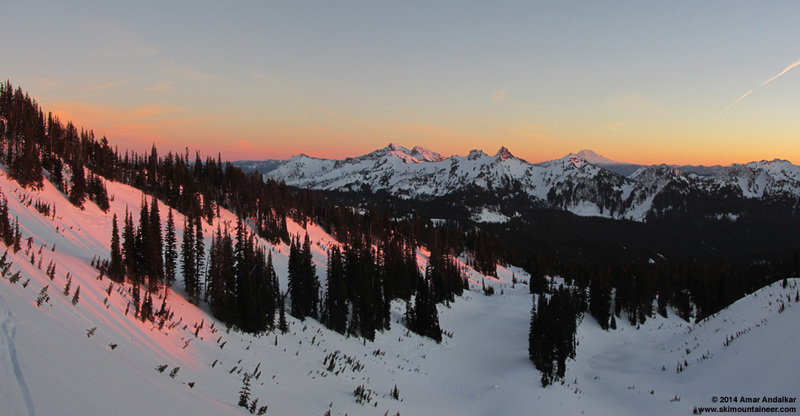 The following tables and daily trip reports are intended to document a narrow slice and one skier's viewpoint of this extraordinary and rare period of summerlike weather and snow conditions in January in the Pacific Northwest. 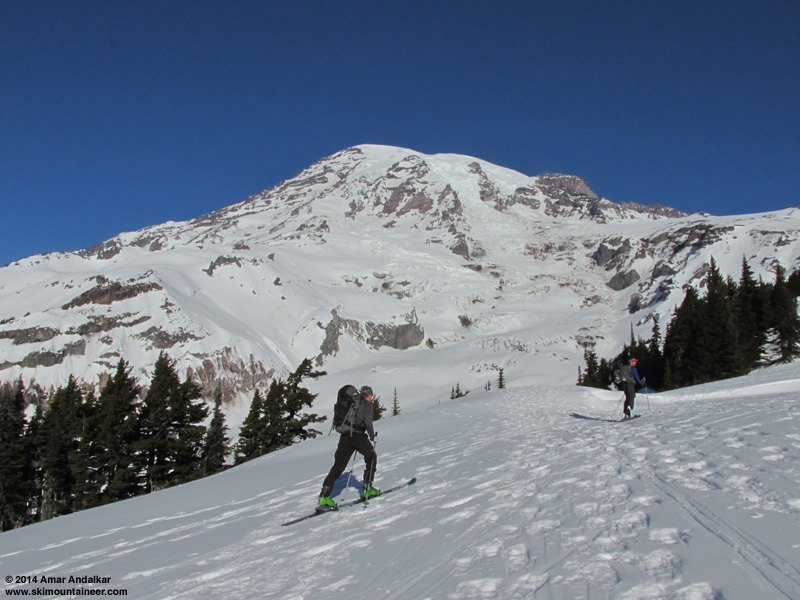 The "Ski Partners" column lists main trip partners (+ skiers who joined on an impromptu basis for Nisqually Chute descents). The "Afternoon Muir Wind" column gives the range of wind speeds recorded between noon and 4pm, the critical time period for these trips. The "Total Solar Radiation" column is the sum of the Solar W/m2 from the telemetry, which roughly gives the total sunlight for the day in units of watt-hours per square meter. One interesting thing to note in this table is that the snowpack at Paradise has been settling at an almost constant rate of 1" per day throughout the 13-day period from January 15-27, after settling rapidly during the first day after the storm cycle ended on the 14th. During that entire period, no precipitation was recorded at Paradise either on the NWAC telemetry or the NPS daily manual measurements after the early AM hours of January 14, but webcam images of the Paradise parking lot reveal that about 1/2" of snow did fall sometime overnight prior to the morning of Wednesday, January 22, enough for the park to actually plow. 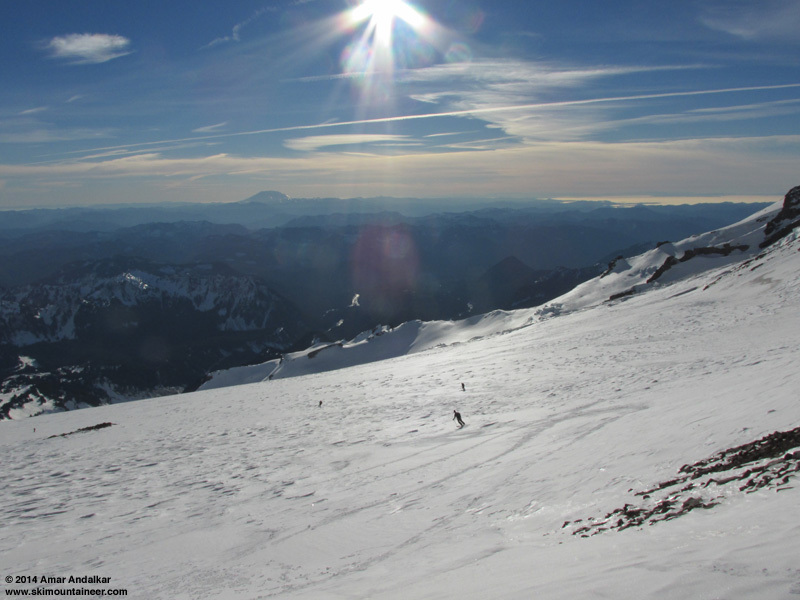 The solar data shows that every day from January 15-26 ended up sunny or mostly sunny at Camp Muir, with similar conditions at Paradise except on January 22 when Paradise was in the clouds most of the morning while Muir was above them. The final day of the period on the 27th ended up much cloudier than forecast, with a thick layer of high clouds providing only filtered sunshine at either site all day. New skis: Dynafit Cho Oyu, 182 cm, 125-89-111, 3530 g (7 lbs 12 oz) with Radical ST bindings. 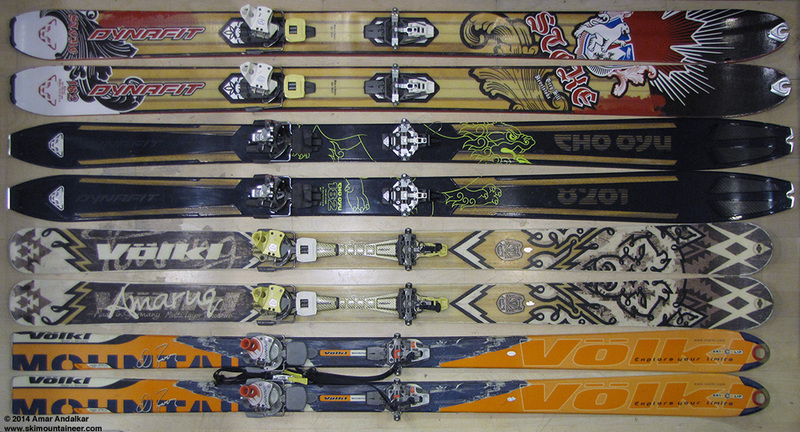 Old skis: Volkl Amaruq, 177 cm, 127-88-109, 4030 g (8 lbs 14 oz) with Vertical FT bindings. The major week-long storm cycle ended on January 14, and the persistent ridge of high pressure off the West Coast quickly rebuilt northward. 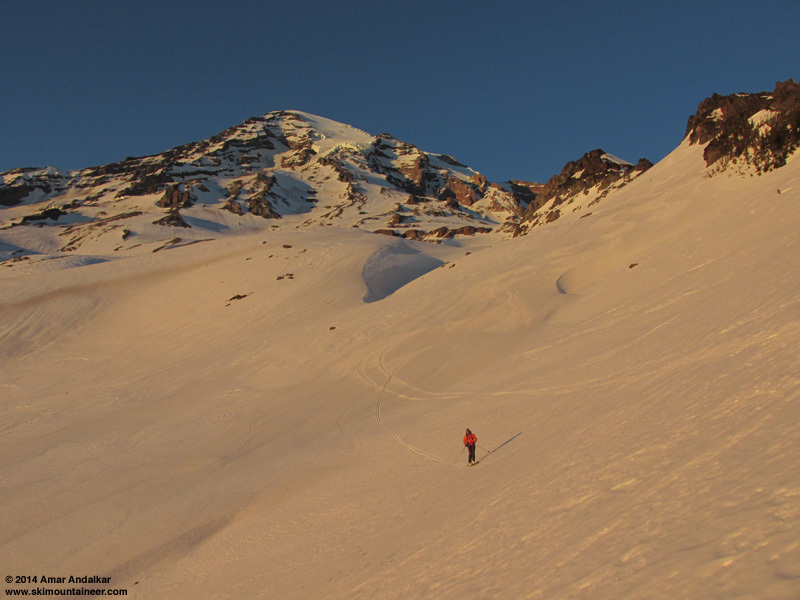 Wednesday the 15th was forecast to be mostly sunny but with high winds aloft, followed by a 2-day window on January 16-17 of near-perfect weather: totally sunny with 10-11000 ft freezing level and light winds even above 10000 ft, so I was planning to ski Mounts Saint Helens and Hood back-to-back on those days. 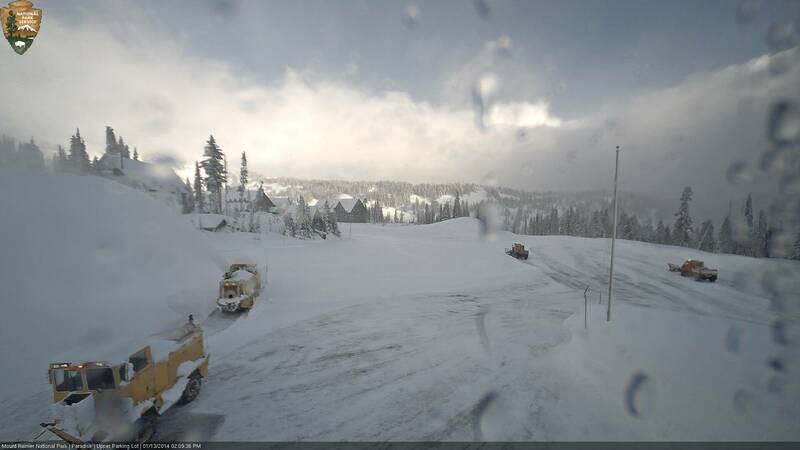 Then the plows left by 3pm (budget constraints are restricting the park to only 1 shift of plow drivers per day), leaving behind a partially plowed lot and uncertainty about the next day's opening time. But the next morning, the plows arrived by 7am and quickly finished the job, opening the road to the public shortly after 9am. 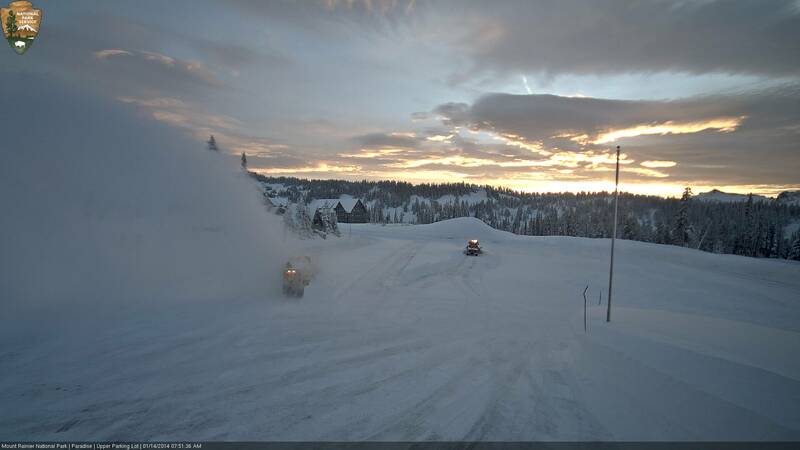 First sunrise on the Mountain after the storm, January 14. I probably should have gone up there just to ski around a bit, but expected the snow conditions to be marginal given the warming at the end of the storm cycle. Then later that morning, I heard that Marmot Mountain Works was having a going-out-of-business sale starting immediately, so I headed there instead. A sad day in the Northwest backcountry skiing community, I never expected such a tangible feeling of loss over a retail store -- but clearly we are losing someplace special. Ended up getting some new boots which I'd been looking at for a long time, the Scott Cosmos (formerly Garmont, with new toe fittings which fix last year's marginal batch). They fit me great, as expected given that I've toured over 500 days on 3 pairs of Garmont Megarides since 2005, and I'll use them for sidecountry trips and when it's too cold to tour in the Dynafit TLT 5P, which has been my primary ski mountaineering boot since last May. 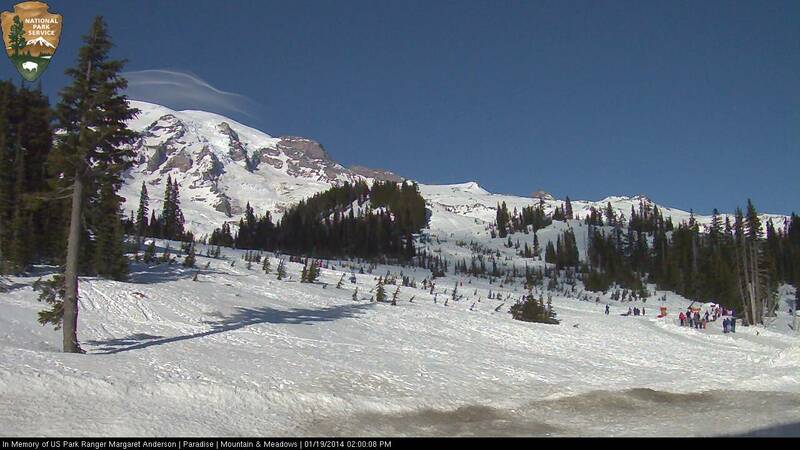 The weather on the 15th looked really good, the first day of June-like weather conditions, but still a bit too windy to head to Camp Muir, one of the few big destinations likely to be avalanche-safe so soon after the storm cycle ended. Decided to go for a big day yo-yoing the lifts at Crystal Mountain instead. 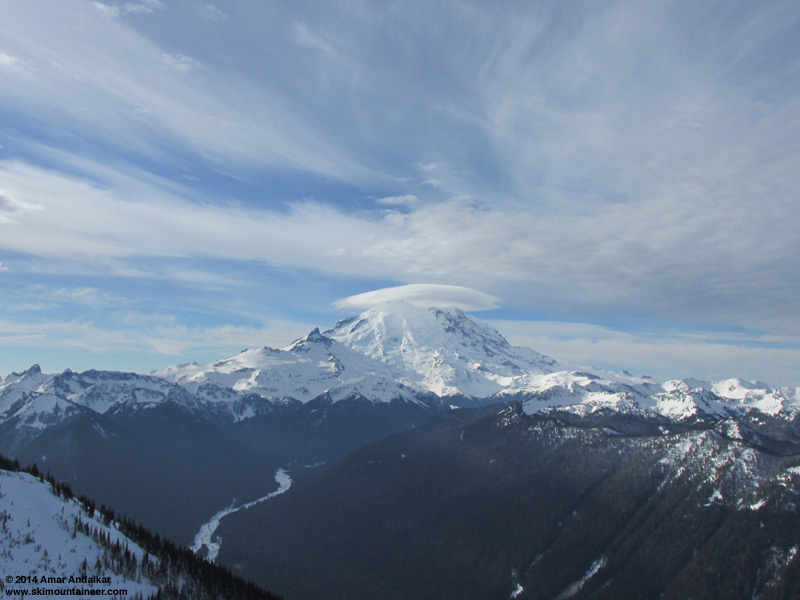 View from atop Crystal Mountain of a pretty lenticular cloud adorning the Mountain and revealing the high winds aloft around noon on January 15. 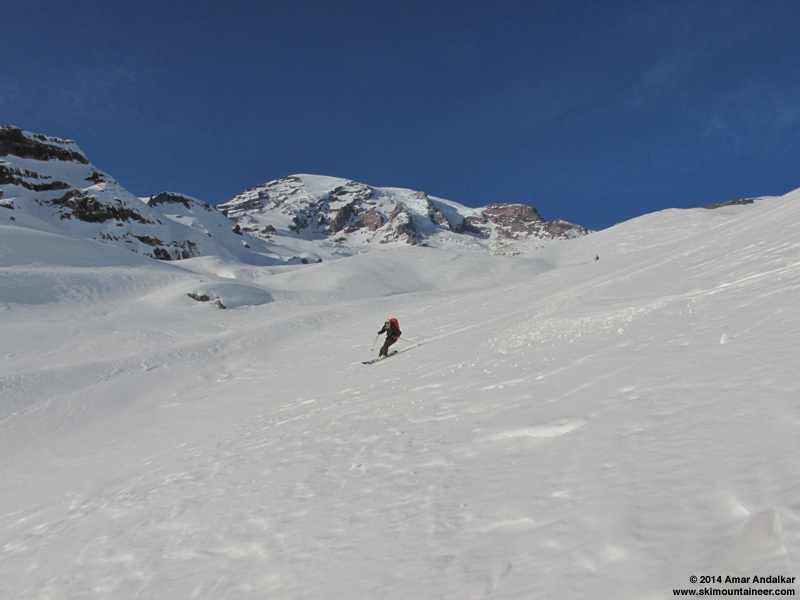 I ran into Mr & Mrs Freebird on the gondola, skied a few runs with them, and decided to join their group on Rainier the next day instead of going to Saint Helens as planned (which was no longer skinnable from the trailhead). 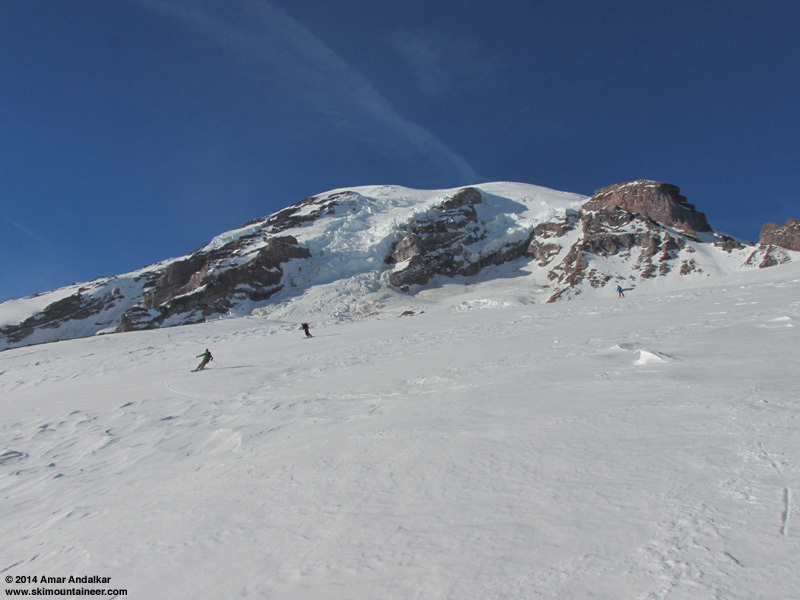 They were planning to ski the Turtle (a glacial remnant adjacent to Wilson Glacier and below the Kautz Ice Cliff) from Paradise with a car shuttle, and that sounded like a great plan to me. SYNOPSIS...AN UPPER RIDGE WILL GIVE DRY WEATHER THROUGH FRIDAY NIGHT. A WEAK FRONT MAY BRING A LITTLE PRECIPITATION TO THE AREA THIS WEEKEND. HIGH PRESSURE WILL STRENGTHEN AGAIN NEXT WEEK. WEDNESDAY...BREEZY. MOSTLY SUNNY. FREEZING LEVEL NEAR 10000 FEET. WEDNESDAY NIGHT...MOSTLY CLEAR. FREEZING LEVEL NEAR 11000 FEET. THURSDAY...SUNNY. FREEZING LEVEL NEAR 11000 FEET. THURSDAY NIGHT...MOSTLY CLEAR. FREEZING LEVEL NEAR 10500 FEET. FRIDAY...MOSTLY SUNNY. FREEZING LEVEL NEAR 11000 FEET. � �CONDITIONS EXPECTED IN THE FREE AIR AT THOSE ELEVATIONS. � �LOWS. WIND IS THE AVERAGE WIND EXPECTED DURING THAT PERIOD. FRIDAY NIGHT...PARTLY CLOUDY. FREEZING LEVEL NEAR 11500 FEET. SATURDAY...PARTLY SUNNY. FREEZING LEVEL NEAR 10000 FEET. SATURDAY NIGHT...MOSTLY CLOUDY WITH A CHANCE OF RAIN AND SNOW. SNOW LEVEL NEAR 6000 FEET. SUNDAY...MOSTLY CLOUDY WITH A CHANCE OF RAIN AND SNOW. SNOW LEVEL NEAR 4500 FEET. SUNDAY NIGHT...MOSTLY CLOUDY WITH A CHANCE OF RAIN AND SNOW. SNOW LEVEL NEAR 5500 FEET. MARTIN LUTHER KING JR DAY...MOSTLY SUNNY. FREEZING LEVEL NEAR 8500 FEET. MONDAY NIGHT...PARTLY CLOUDY. FREEZING LEVEL NEAR 9000 FEET. TUESDAY...SUNNY. FREEZING LEVEL NEAR 8500 FEET. Re: Juneuary 16-26, 2014, Rainier, 10K to Bridge CORN! An exceptionally nice day with exceptionally good snow conditions, a pleasant surprise to find the snow surface already well-consolidated on all aspects and mostly smooth corn on steeper southerly aspects just 2 days after the major storm cycle ended. What a way to get Juneuary really rolling! 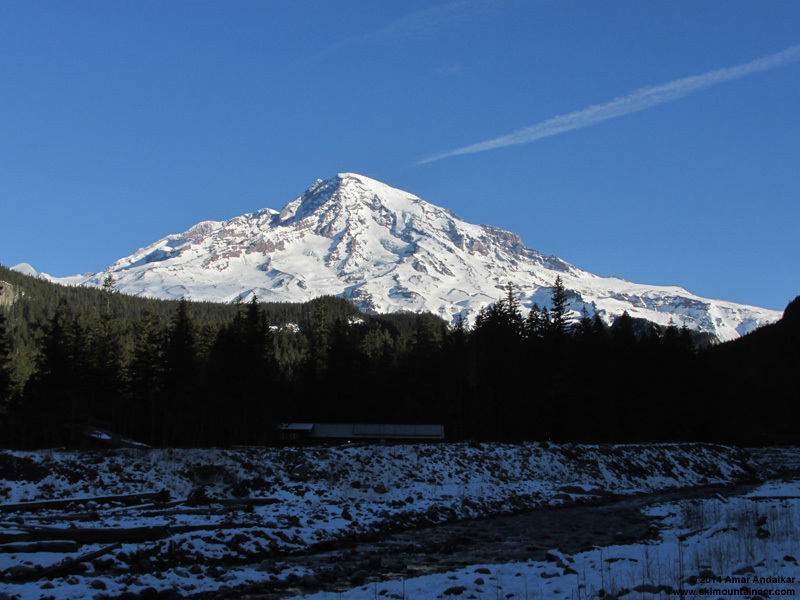 Morning view of the Mountain above the Nisqually River at Longmire, January 16. Zoomed view from Longmire, with the Van Trump Glaciers and Turtle at right center. Met the group of 5 others (the Freebirds, shred, Rory, Jameson) at the Longmire gate just after its 9am opening the next morning, still planning to continue on to Hood solo that evening, and we set up the car shuttle: I convinced them to leave the extra car at Nisqually Bridge (3900 ft) instead of Christine Falls trailhead (3600 ft), since the snowpack in the steep woods above the trailhead looked much too thin (1-2 ft) for decent skiing, while the ski down to the bridge would be an easy cruise on 3-4 ft of well-consolidated continuous snow out in the open. 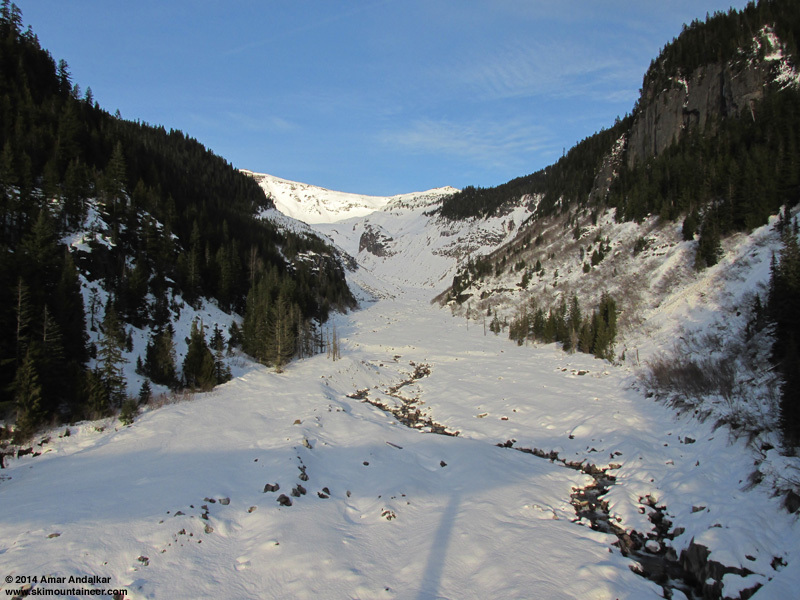 I also knew a nice hidden exit route (one I'd last done 17 years earlier in May 1997) that would allow us to ski the south-facing Van Trump Glaciers from the 10000 ft level on the Turtle and still exit out to Nisqually Bridge via the moraine just west of the Nisqually Glacier terminus. This would be much better than having to ski the SE aspects along Wilson Glacier which we would ascend to reach the Turtle, as those would be out of the sun and re-freezing by the time we skied down in late afternoon. 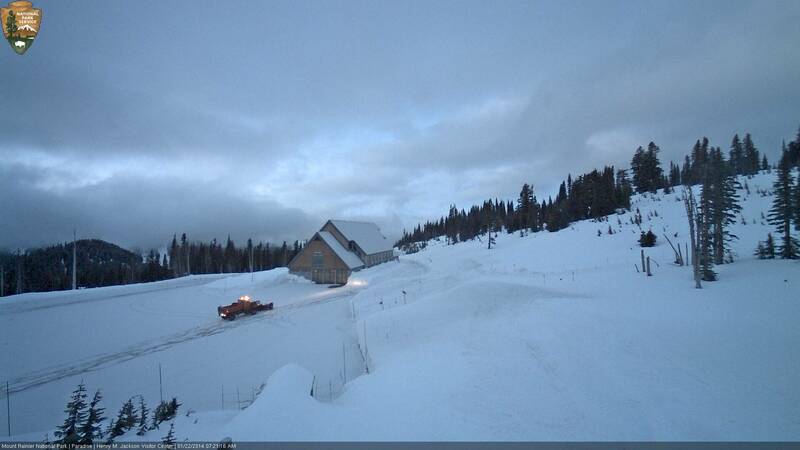 The park's snowcat begins constructing the snowplay area on the slope behind the snowblower -- the snowdepth at Paradise had finally reached the required 5 ft during the previous week's storm cycle. Before the trip I hadn't been sure if the snow would be consolidated enough for good skiing, or perhaps an unconsolidated mess, given that the first major storm cycle of the 2013-14 season had just ended a few days earlier, bringing over 5 ft of new snow to Paradise and increasing the snow depth from 56" on January 7 (only 55% of normal for that date) to 106" on January 12 (100% of normal! ), then settling to 98" by January 15 (88% of normal). But that turned out to be a non-issue: a solid surface wind-and-sun crust covered almost everything on all aspects, topped by a couple inches of windblown powder in spots, fully-supportive and edgeable on skis, but not really so on foot with deep postholing into 2 ft of partially-consolidated snow below the crust for those not on skis. 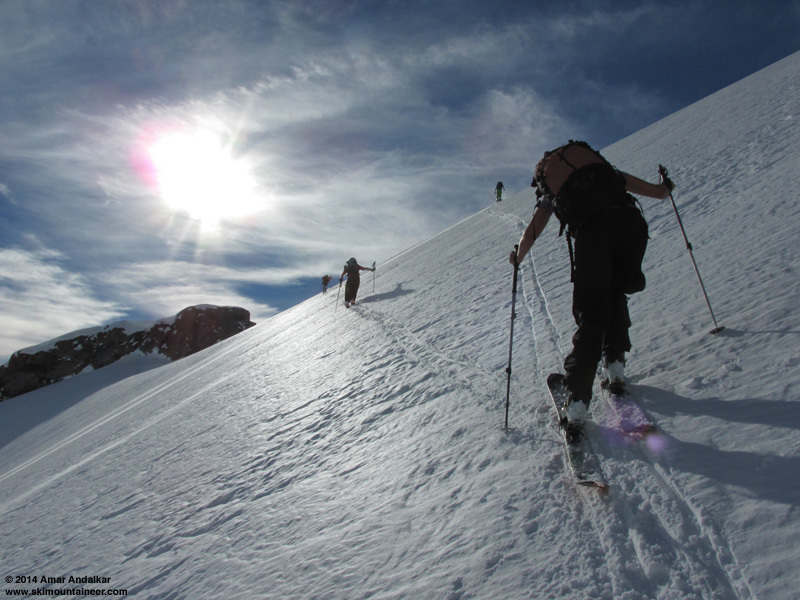 Easy travel on skis and skins, but with ski crampons essential on most steeper or shadier aspects. Leaving the Paradise stampede path and breaking our own trail in a new direction towards Glacier Vista. 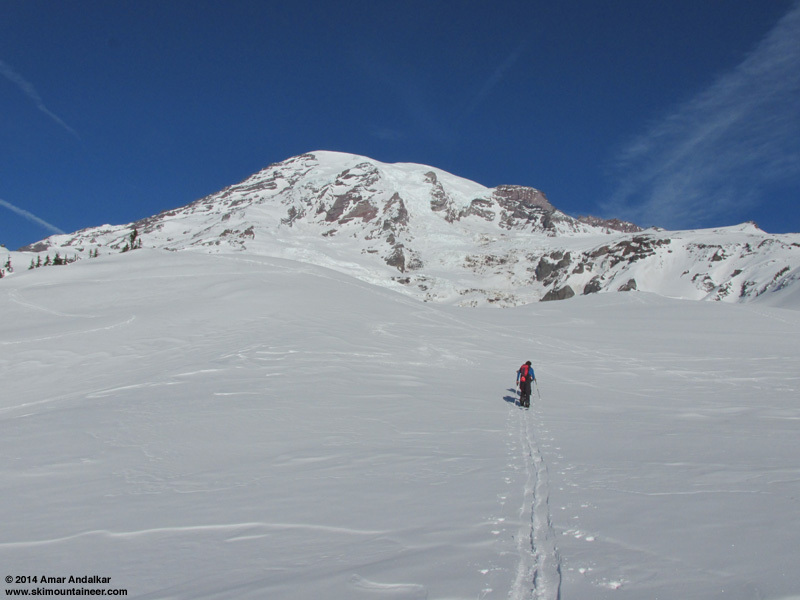 We left Paradise a bit after 10am and skinned to Glacier Vista at 6350 ft, then ripped skins for the steep and frozen 150 ft descent down to the Nisqually Moraine -- unfortunately one of us took a slide without gloves on, bloodying a hand pretty well. That little slope is always dangerous in frozen morning conditions. From this point on, we would see no one else all day until reaching Longmire well after dark. 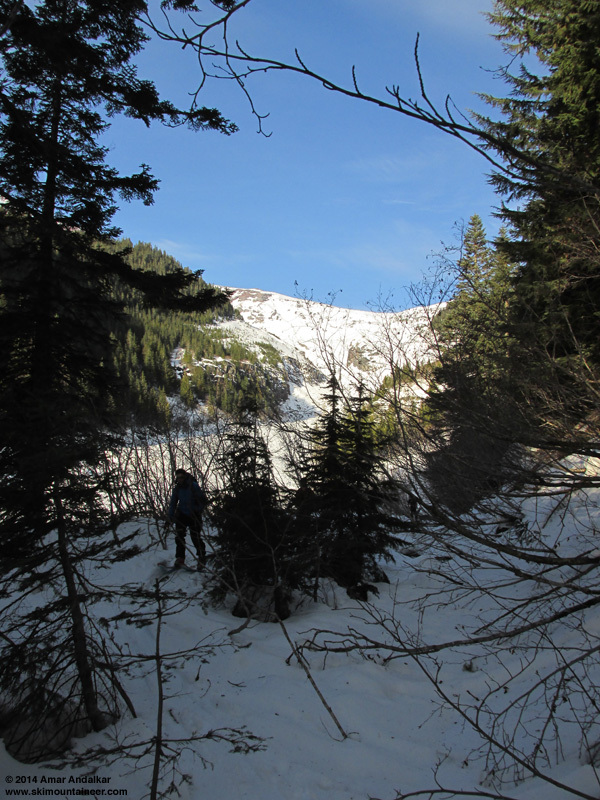 Crossed the Nisqually Glacier near the 6400 ft level below an outcrop of icy spires not yet buried by winter snows, then up via the Wilson Gully from 6800-7400 ft. This portion is exposed to serac fall hazard from a small ice cliff looming overhead, with no real way to avoid this hazard (over the last 2-3 years) if you currently wish to do the route at all. The Fan, a distasteful gully to the left of the large vertical rock cliff, is steeper and exposed to cornice fall hazard, and also the only place that even had a chance of avalanche hazard this day -- large crowns from storm-slab avalanches a few days earlier were visible on the steep wind-loaded E and SE aspects at its top, too. Ski crampons became essential for the next portion of the route, a rising traverse left from the big plateau at 7400 ft up to the notch in the ridge near 7700 ft. 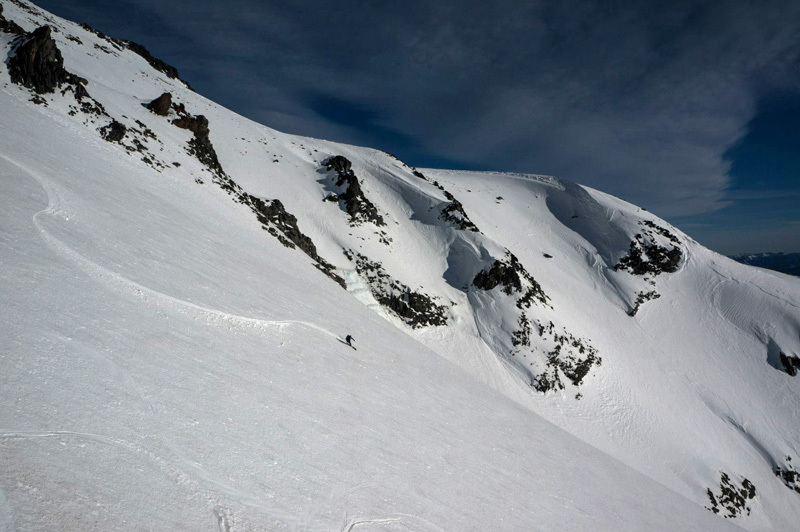 This was the sketchiest part of the entire ascent, a 40-degree sidehill in firm conditions with ski edge penetration varying from a few inches to barely a few millimeters at times on firmer patches. Postholing deeply on foot would have been worse though, and we all made it up on skins with ski crampons -- thanks for the nice low-angle track, Jeff and Carl. The next bit of ridge up to 8100 ft also featured some firm sketchy sidehill, on the left edges this time and already partially shaded by just after noon. I checked out the easier detour via the broad south-facing (sun-warmed!) bowl to the left of the ridge, but was unsure if that had enough snow at its top to connect (it does not yet this year) and so returned to the track on the firm shady side. 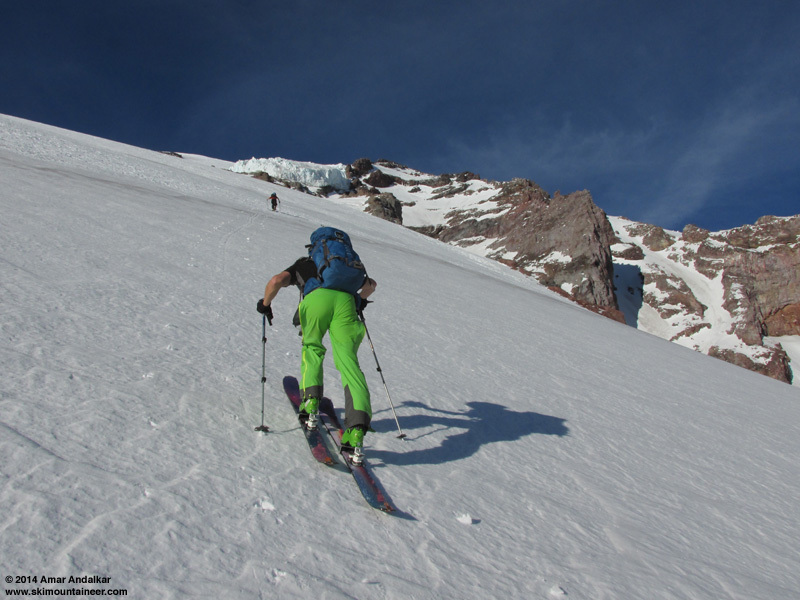 Skinning the firm NE-facing sidehill along the edge of Wilson Glacier near 7900 ft, with our ski descent onto the Nisqually Glacier visible above the jutting rock outcrop. We took a lunch break atop a small outcrop near 8100 ft, and then enjoyed an easy cruise up the broad moraine crest beside Wilson Glacier which extends to 8600 ft. Another steeper set of switchbacks above that, but quite easy on nicely softened snow, and then angling sharply left around the large rock outcrops near the standard 9200 and 9400 ft campsite areas, staying on the sunny south aspects as much as possible and away from the steep shady SE slopes of the Wilson Glacier itself. It was already 3pm by the time we reached the Turtle at its 9800 ft terminal moraine, and the sun was now barely warming this SSE aspect, glancing obliquely across it. The slope was steep, firm, and very sketchy to skin even with ski crampons. 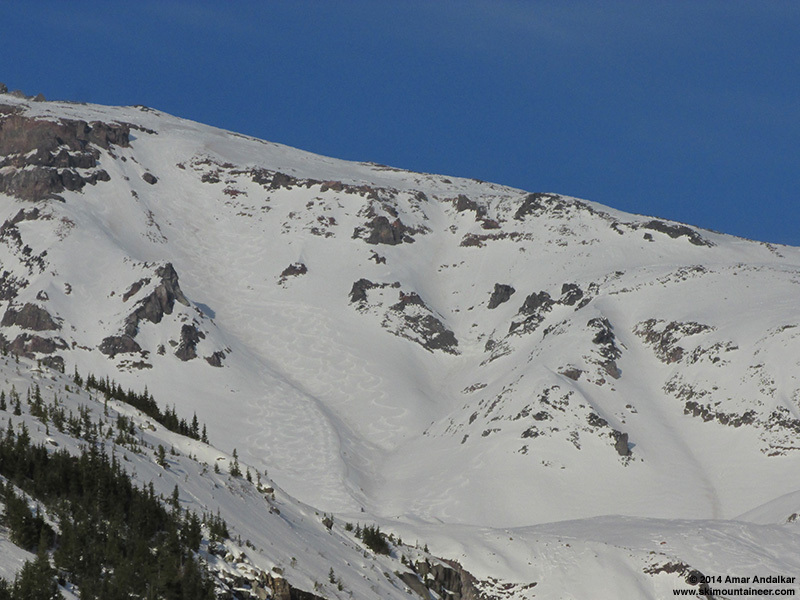 The skins and ski crampons barely leave a mark on the steep firm snow of the Turtle, with the Kautz Ice Cliff looming overhead and the hidden gully of Fuhrer Thumb at right. Half of us switched to booting with foot crampons at 10000 ft, but the others made it the whole way on ski crampons to our high point at 10500 ft at a flat spot on the ridge west of the Turtle. Winds were very light and variable, mostly 5-10 mph with some higher gusts, and temps were in the mid 30s �F. 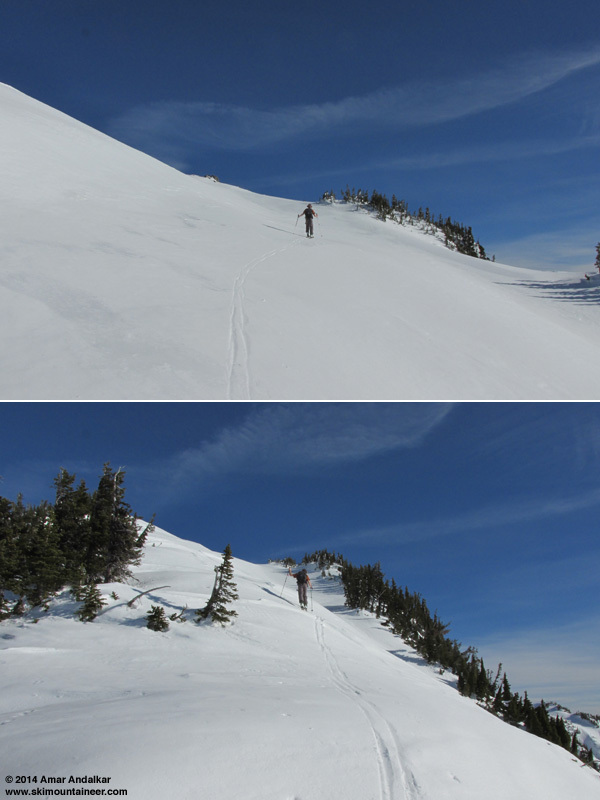 Skied down at 4:15 pm, 2 of us choosing the easy way via the Turtle, the other 4 traversing across 100 yards of loose scree to ski a south facing gully instead. Regardless, it was too late and too high on this day, and snow conditions were firm until we dropped below 9800 ft, at which point it was nicely corned if you stayed on the smoother and dustier aspects (which had absorbed the most sun). Smooth corn on the uppermost slopes of the Van Trump Glaciers near 9000 ft.
We skied the open bowls which hold various small remnants of the Van Trump Glaciers, and our descent routes reunited below 9000 ft. 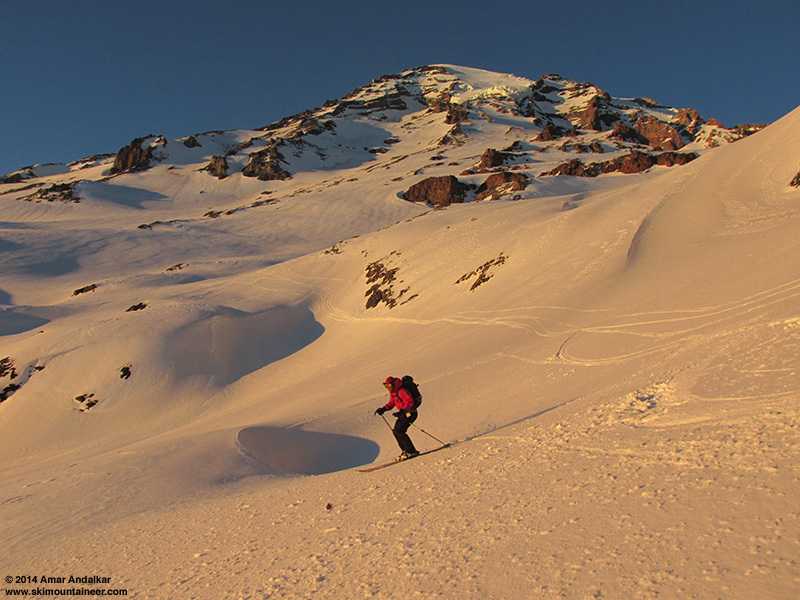 Skiing smooth corn at sunset on the Van Trump Glaciers. 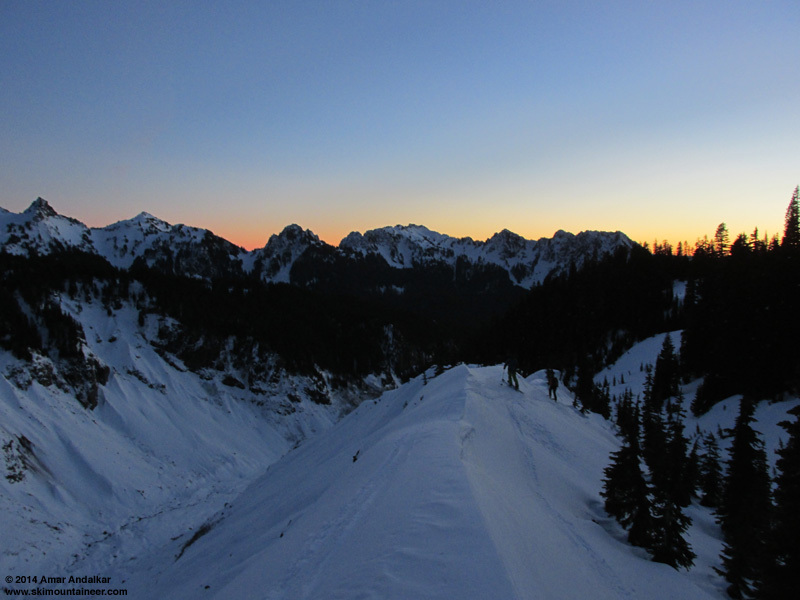 By staying on the most southwesterly aspects which were still getting direct sunlight, we enjoyed smooth corn almost the entire way down to treeline at 6200 ft by sunset (4:45pm this day). The lighting conditions were just as spectacular as the snow conditions, a golden glow slowly turning rosy on the upper Mountain. It was now time to pull off the exit back into the Nisqually drainage, the goal being to end up at 5400 ft atop the moraine just west of the Nisqually Glacier terminus -- about 3/4 mile of traversing to do, with 800 vert to work with from 6200 ft. I took a quick look at the map and then navigated through the open subalpine forests by dead reckoning and my internal compass, along with faint memories of having gone roughly this way 17 years earlier -- however 1996-97 was a huge snow year, and snowdepth at Paradise was well over 200" in early May 1997, so things looked very different that time with a deep snowpack burying most terrain features. Lots of small gullies to cross this time, the route traverses left through a couple open bowls and across some semi-steep slopes, avoiding cliff bands both above and below at various points. Thankfully the routefinding worked great in the fading light, and we popped out at the upper end of the moraine near 5400 ft exactly as planned, a few minutes after 5pm. Yay! 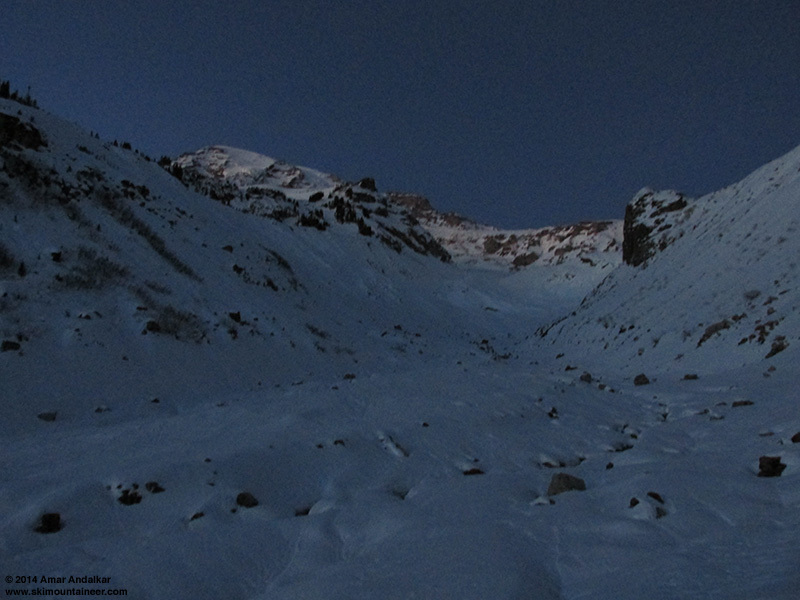 Snow conditions had deteriorated severely in the twilight though, turning to a mix of supportive and breakable crust. 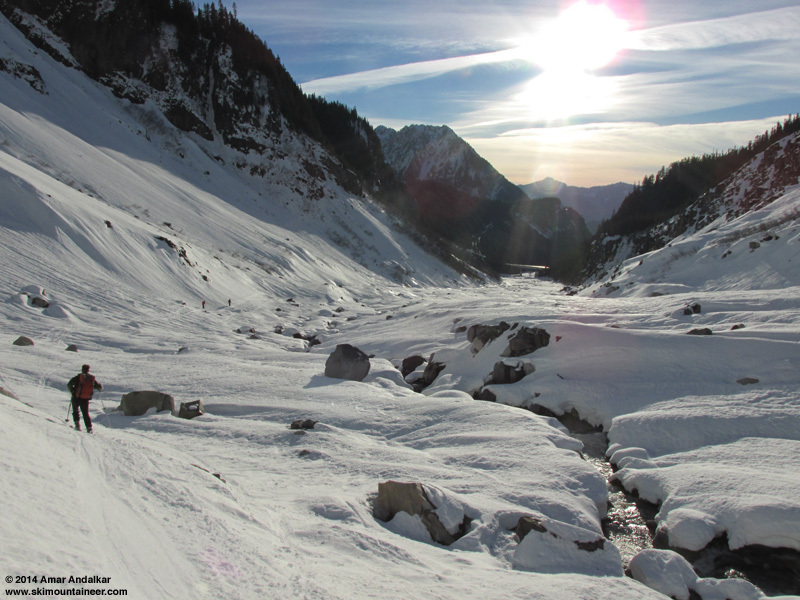 The 600 ft ski descent from the moraine crest to the Nisqually River was not very good, requiring careful skiing to avoid knee injury. The snow improved nicely along the river though, well consolidated and supportive, and we quickly cruised down to the ramp at the east end of Nisqually bridge by 5:30pm as the last light faded away. The rising traverse through the slide alder to reach the road needed headlamps, and I should have put on skins to make it easier too, as the snow was firmly frozen and very slick without skins, while booting was nearly impossible due to thigh-deep postholing. The vehicle we had left at the bridge parking lot had a warning notice on it, but our two other cars in the Paradise parking lot had none. Exiting the Longmire gate at 6:45pm was no problem, just go in the front desk of the Longmire Inn, enter your name, address, and vehicle info in the logbook, and the clerk walks all the way out to open the gate for you. Unfortunately the Copper Creek had just closed when we got there at 7pm, but we enjoyed a fine meal of burgers and fish&chips and salads at the Highlander in Ashford instead, along with $13 pitchers of Moose Drool. An outstanding day with a great group and truly fine skiing, 6600 vert in a single run from our high point to the bridge. But I was beat, way too beat to even consider driving the 190 miles from Ashford to Timberline on Mount Hood -- the route from Paradise to the Turtle is always much more tiring and takes more effort than numbers alone would indicate. 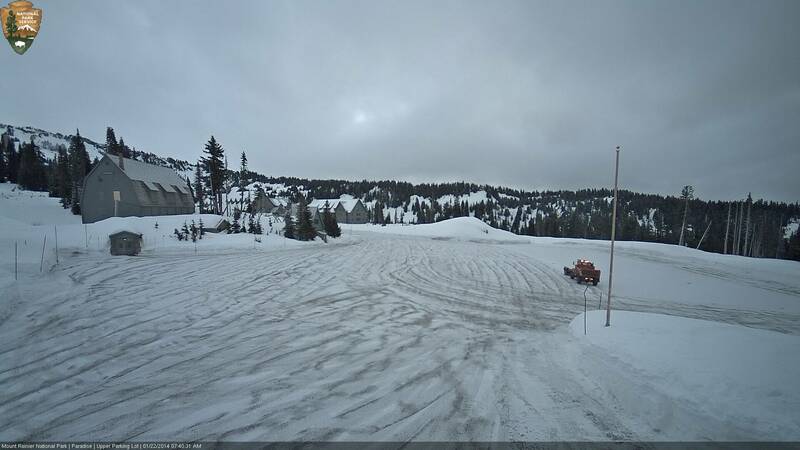 It would be much better to just stay somewhere nearby, and ski on Rainier again the next day. 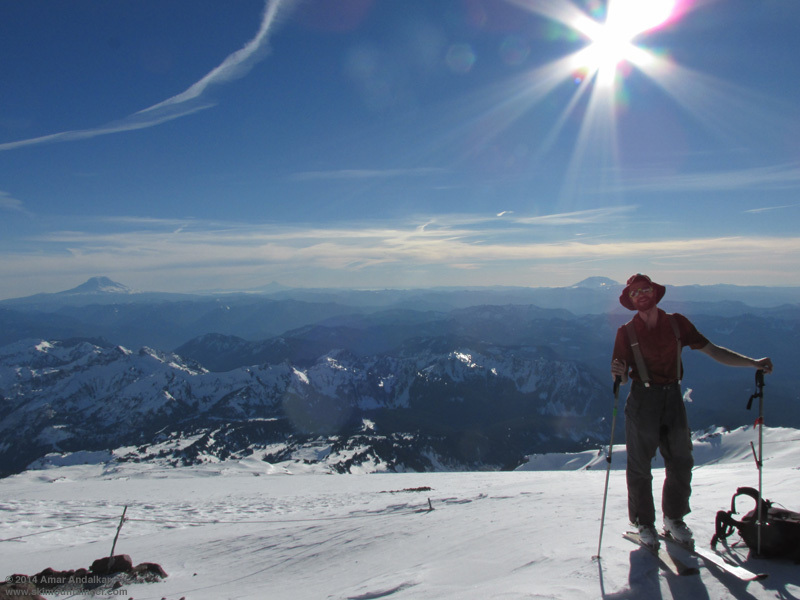 I had cell service in the Highlander parking lot, and tried to drum up some partners to meet me at the Longmire gate the next morning and repeat the car shuttle, this time intending to ski Muir and Nisqually Chute. Eventually I headed back to Longmire for the night, still unsure of partners for the next day, and spent the night in my car at the Eagle Peak trailhead with its spectacular view, mesmerized by the full moon's glow on the Mountain all night long through the windshield. Too bad that I didn't think to try some night photos using the mini-tripod (Ultrapod II) that I always carry, oh well, they might not have come out too great since I only had a compact ultrazoom camera (Canon SX160 IS) and not a DSLR. SYNOPSIS...AN UPPER RIDGE WILL BRING DRY WEATHER THROUGH FRIDAY NIGHT AT LEAST. 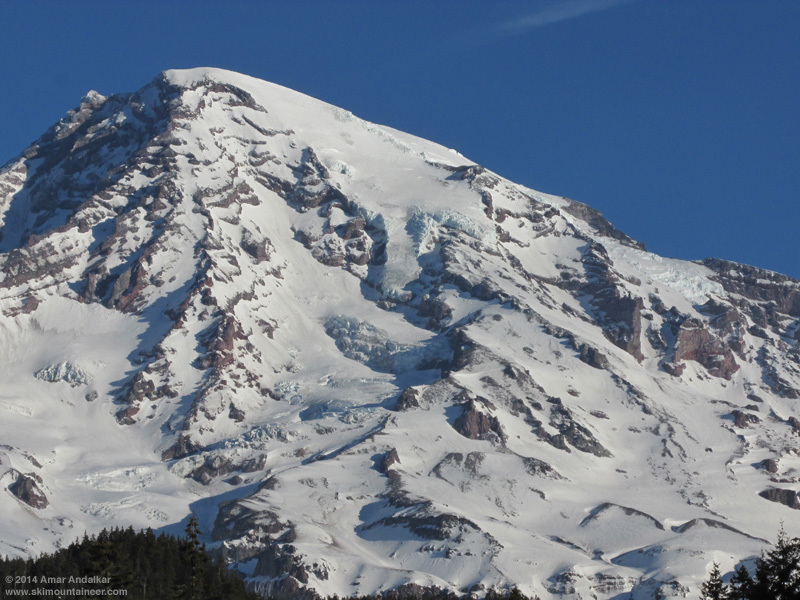 A WEAK FRONT MAY BRING A LITTLE PRECIPITATION TO MOUNT RAINIER NATIONAL PARK THIS WEEKEND. HIGH PRESSURE WILL STRENGTHEN AGAIN NEXT WEEK. FRIDAY...SUNNY. FREEZING LEVEL NEAR 11000 FEET. SATURDAY...PARTLY SUNNY. FREEZING LEVEL NEAR 10500 FEET. SATURDAY NIGHT...MOSTLY CLOUDY WITH A CHANCE OF RAIN AND SNOW. SNOW LEVEL NEAR 7500 FEET. SUNDAY...MOSTLY CLOUDY WITH A CHANCE OF RAIN AND SNOW. SNOW LEVEL NEAR 6500 FEET. SUNDAY NIGHT...MOSTLY CLOUDY WITH A CHANCE OF RAIN AND SNOW. SNOW LEVEL NEAR 6000 FEET. MARTIN LUTHER KING JR DAY...MOSTLY SUNNY. FREEZING LEVEL NEAR 8000 FEET. MONDAY NIGHT...PARTLY CLOUDY. FREEZING LEVEL NEAR 10000 FEET. TUESDAY...MOSTLY SUNNY. FREEZING LEVEL NEAR 9500 FEET. TUESDAY NIGHT...MOSTLY CLOUDY. FREEZING LEVEL NEAR 8500 FEET. WEDNESDAY...PARTLY SUNNY. FREEZING LEVEL NEAR 7500 FEET. Enjoyed a glorious dawn and sunrise the next morning, standing and shivering and shooting photos on the bank of the Nisqually River for 20 minutes, before heading to the Longmire Inn for a nice breakfast omelet while I waited for the 9am gate opening. 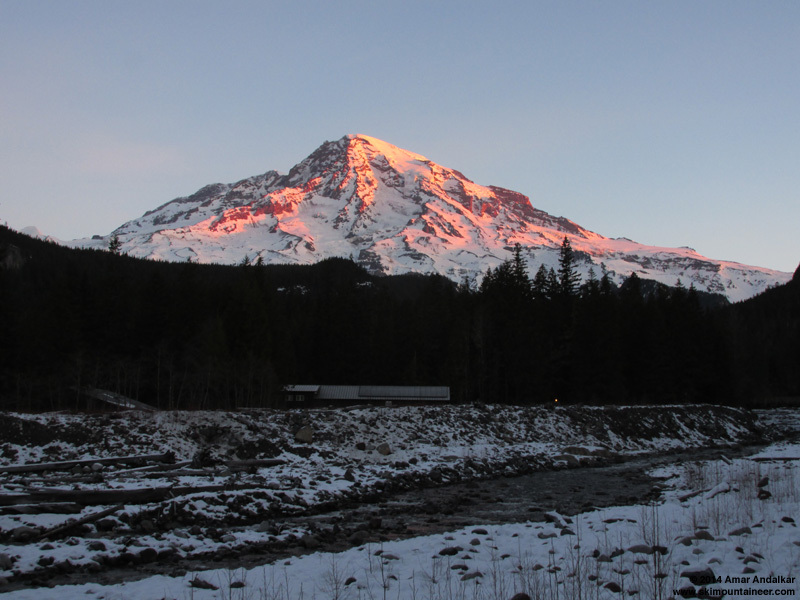 Sunrise glow on the Mountain above the Nisqually River at Longmire, January 17. As I came back outside, I was glad to see that Kam had arrived to join me and set up another car shuttle (there's no cell service at all in Longmire, so I had not gotten his text reply). We dropped off a car at the bridge and skinned up from Paradise just before 10:30am, even though I was really slow getting ready and then really dragging after that, exhausted from 2 straight big days. The route up Panorama Face looked way too firm for easy skinning, everyone we could see was being forced to boot up it, so I suggested we head around to the right and ascend the south face of the SW ridge of Panorama Point, a standard winter variation which gets sun and softens at least 2-3 hours earlier than Pan Face does. This worked out great, the snow was nicely softened although we used ski crampons anyway for insurance, and 4 quick switchbacks put us atop the ridge crest for an easy cruise the rest of the way up Pan Point. This also avoided the potentially serious hazard of falling bodies on Pan Face, which can be a significant risk on busy days with firm frozen conditions in the morning. The excellent route up the the south face of the SW ridge of Panorama Point, no crowds, no hassle, and a nice clean skin track. The steep rolls near 7000 ft were also nicely softened in the sun, and skinned easily too. The iciest part of the entire route was from about 7000-7200 ft, with large areas of hard water ice for about a 1/4 mile along the winter route, and isolated icy patches continued past McClure Rock and 7500 ft. 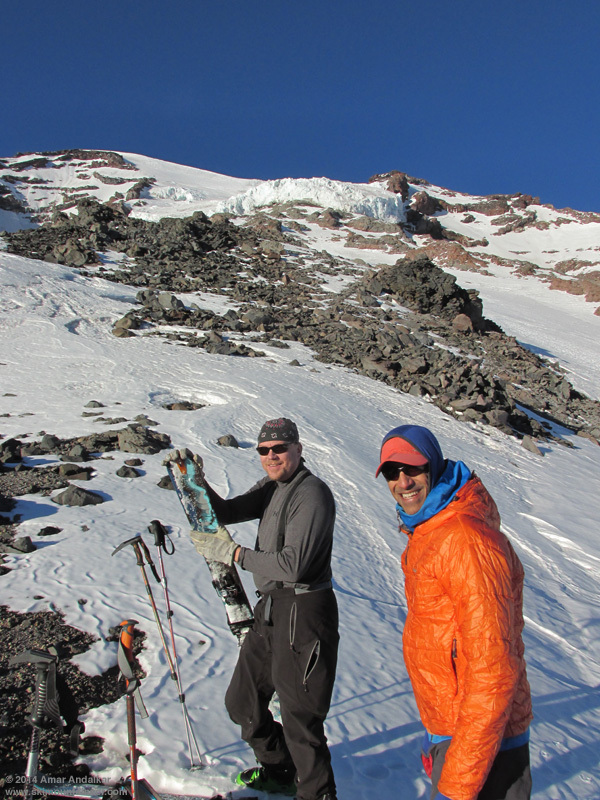 The ski crampons were not needed above 7700 ft, and the rest of the route was an easy cruise in gorgeous calm weather. 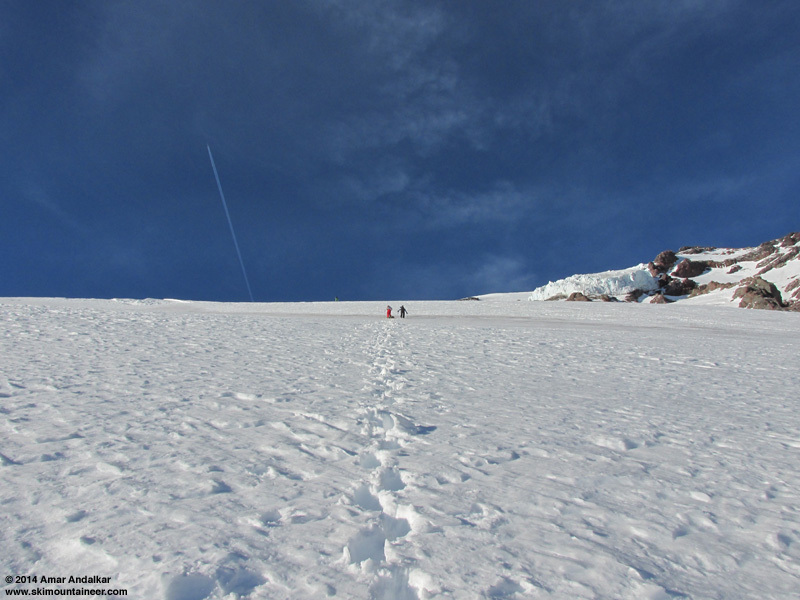 We strolled into Camp Muir just after 2pm, just amazingly nice weather for January or June or anytime, over 40 �F and winds 0-5 mph. Met a few others up there who were interested in joining us for the run down to the bridge, especially given the offer of a car shuttle, and we skied down as a group of five around 2:45pm. Mostly smooth windpack on the upper snowfield, fairly good skiing, and very very nice compared to typical winter snow conditions up there. 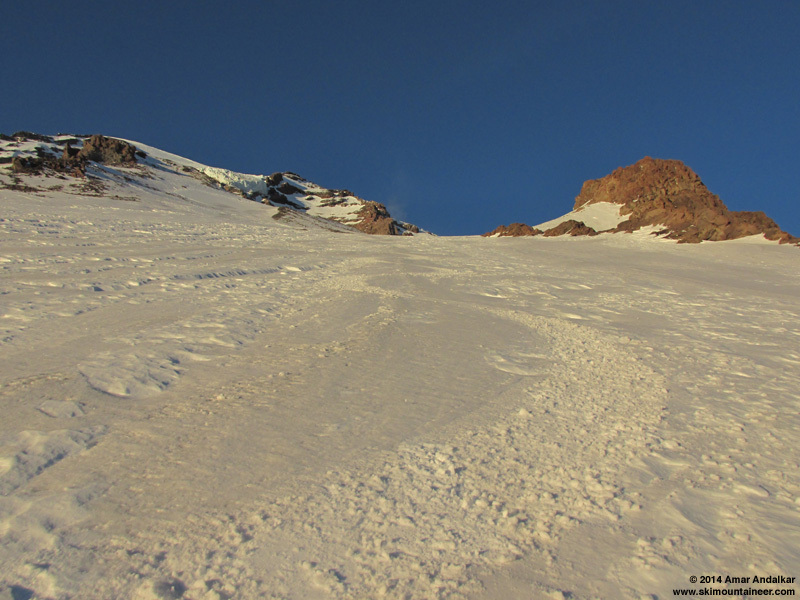 Below 9000 ft, steeper rolls were softened into good corn, and the well-corned rollover at 8400 ft above the entrance to Nisqually Chute made us confident that the entire Chute would be in prime shape. There were already a dozen or more tracks in the gut of the Chute, from earlier in the day and the previous 2 days, but the entire open slope to skier's left had not a single track on it yet. Just awesome smooth soft corn, perfect for carving big sweeping turns down the entire untracked face in a single shot. The snow was perhaps a bit too soft on the lower half, an hour earlier might have been better, but it never got sticky or gloppy. 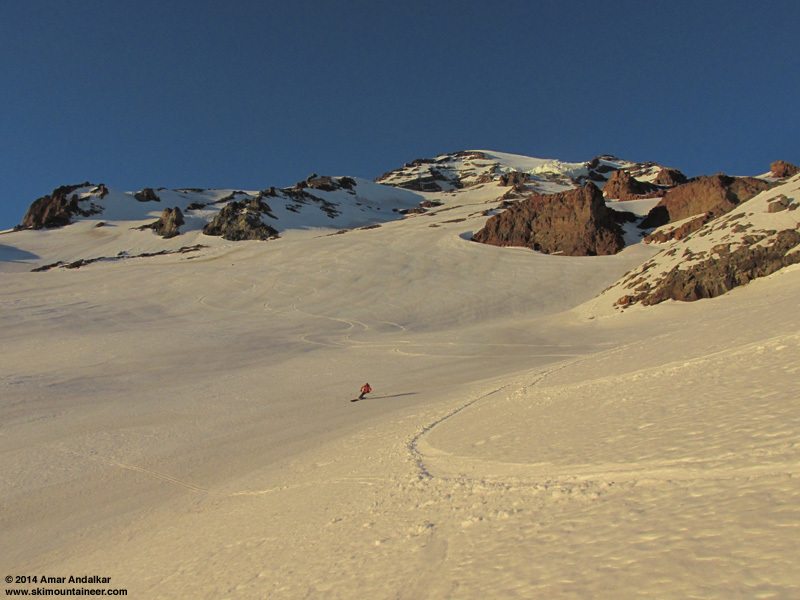 The flattening angle near the bottom of the Chute made the snow near-perfect again, as we zoomed out onto the smooth surface of the Nisqually Glacier at high speed. The run down the glacier to its terminus was mostly great, lots of smooth corn with only a few over-softened parts that had not consolidated well yet. We skied down the east side of the glacier terminus and then joined the fast track out along the river, now smoothed into a highway by dozens of skis. 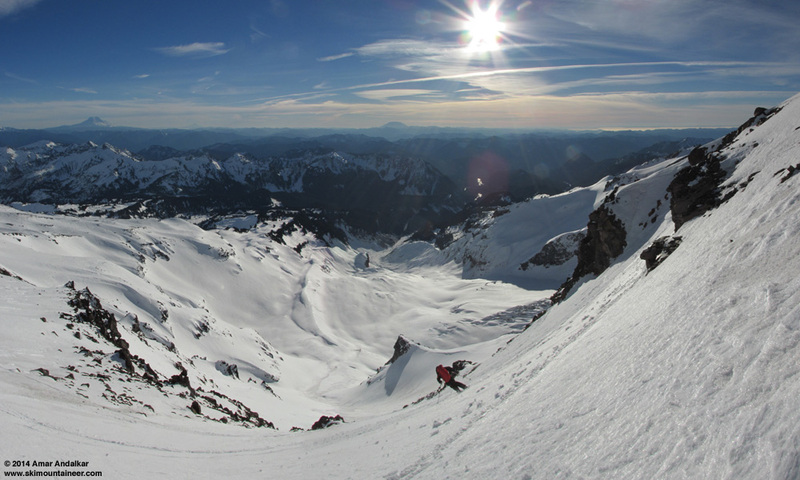 Zoomed view from the edge of the alder, looking back at numerous ski tracks in Nisqually Chute and on the glacier below. We made sure to use skins for the slide alder ramp leading up from the east side of the river to the bridge this time. 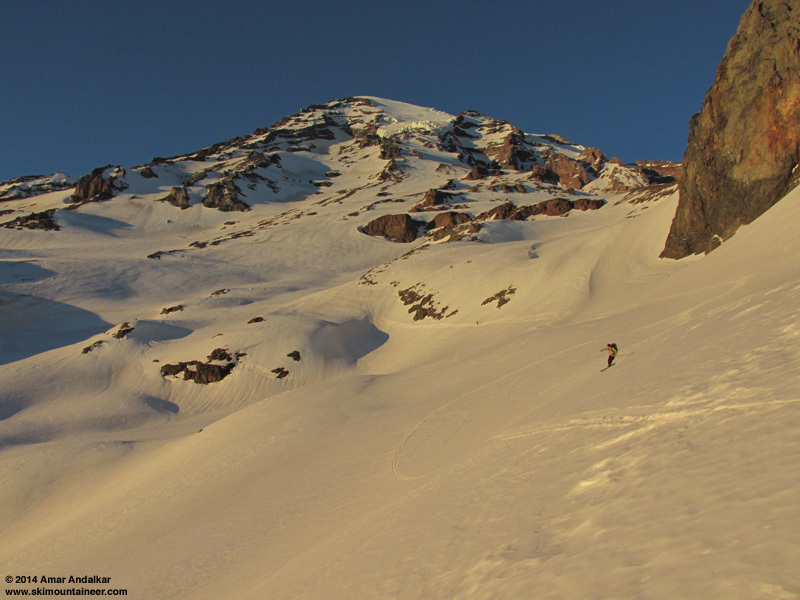 It's always nice to enjoy a little flavor of the North Cascades at the end of a trip on Rainier. We were out to the bridge before 4pm, comfortably well before dark unlike the previous day. View from Nisqually Bridge looking back up the river, with Nisqually Chute visible in the bright sunlight at center. Another run of over 6000 vert, two days in a row of epic corn conditions in mid-January! And a total of 13000 vert of skiing for only 10000 ft of gain, the car shuttle gaining us an extra 1500 vert each time. 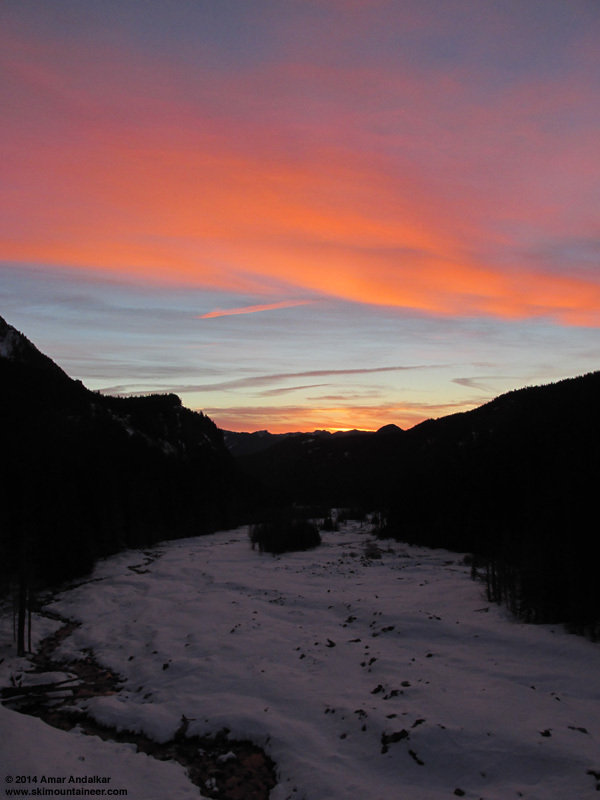 By the time we finished shuttling the cars, the glow of another awesome sunset was upon the Mountain again too. 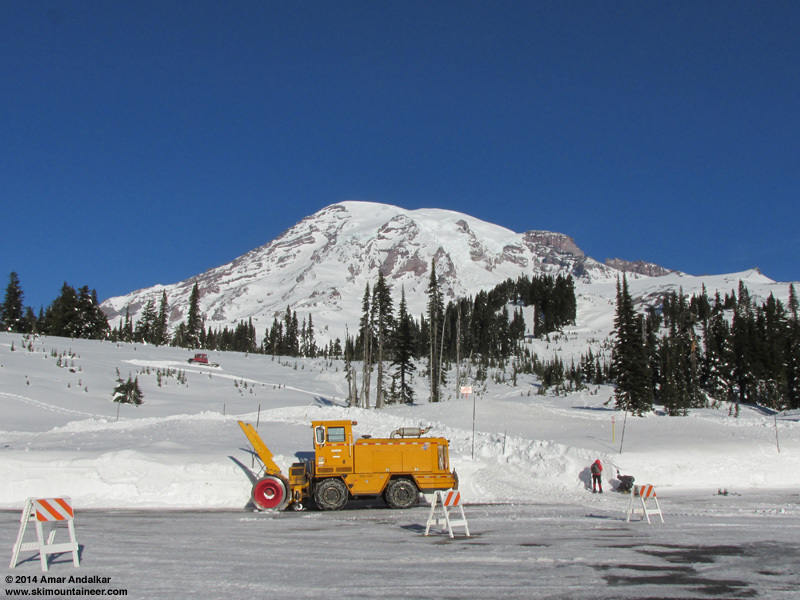 SYNOPSIS...AN UPPER RIDGE WILL BRING SUNNY MILD WEATHER TO MOUNT RAINIER NATIONAL PARK FRIDAY. HIGH CLOUDS WILL INCREASE SATURDAY...AND SUNDAY SHOULD BE CLOUDY BUT REMAIN DRY AS THE REMAINS OF A WEAKENING FRONT MOVE THROUGH. THE UPPER RIDGE WILL STRENGTHEN AGAIN NEXT WEEK FOR MORE DRY WEATHER. FRIDAY...SUNNY. FREEZING LEVEL NEAR 10500 FEET. FRIDAY NIGHT...PARTLY CLOUDY. FREEZING LEVEL NEAR 11000 FEET. SATURDAY NIGHT...MOSTLY CLOUDY. FREEZING LEVEL NEAR 9000 FEET. SUNDAY...CLOUDY. FREEZING LEVEL NEAR 8500 FEET. CONDITIONS EXPECTED IN THE FREE AIR AT THOSE ELEVATIONS. LOWS. WIND IS THE AVERAGE WIND EXPECTED DURING THAT PERIOD. SUNDAY NIGHT...MOSTLY CLOUDY. FREEZING LEVEL NEAR 8000 FEET. MARTIN LUTHER KING JR DAY...PARTLY SUNNY. FREEZING LEVEL NEAR 8000 FEET. TUESDAY NIGHT...PARTLY CLOUDY. FREEZING LEVEL NEAR 8500 FEET. WEDNESDAY...MOSTLY SUNNY. FREEZING LEVEL NEAR 7500 FEET. WEDNESDAY NIGHT...PARTLY CLOUDY. FREEZING LEVEL NEAR 8000 FEET. THURSDAY...MOSTLY SUNNY. FREEZING LEVEL NEAR 7500 FEET. Juneuary 18, 2014, Marmot Mountain Works: New Skis! I really needed a rest day after 3 straight tiring days, and with winds forecast to increase substantially on Saturday the 18th, it seemed like a good day to rest, followed by a day of watching the AFC/NFC championships during even windier and cloudier weather on Sunday the 19th as a weak system brushed the northern edge of the upper level ridge of high pressure. Spent most of Saturday at Marmot Mountain Works during their going-out-of-business sale, thermofitting the new Scott Cosmos boots that I bought on the 14th, and also buying new skis which they mounted while I was there: the new 2014 Dynafit Cho Oyu (182 cm, 125-89-111), to replace the Volkl Amaruq (177 cm, 127-88-109) which has been my main ski mountaineering setup since my previous similar skis, the K2 Mount Baker Superlight, had a toepiece rip out at 13200 ft on Rainier in June 2011 (see TR). But the Amaruqs now have over 160 days of hard use primarily in spring and summer conditions and are quite thoroughly thrashed, with at least 6 separate cracks in the edges, and the Vertical FT bindings on them have over 310 days of similar hard use and abuse, with repeated exposure to volcanic ash and grit. Not a setup I could really trust anymore on steep exposed terrain or heavily crevassed glaciers, where one's life depends on the edges and bindings, so they're now my late-summer and early-autumn rock skis. The new setup is amazingly light: the Amaruq is a very lightweight ski (1400 g at 177 cm), but the Cho Oyu is truly ultralight at 1140 g for 174 cm or 1190 g for 182 cm (measured weights). The total weight of the new 182 cm Dynafit Cho Oyu setup with Radical ST bindings and leashes is 3530 g (7 lbs 12 oz), versus 4030 g (8 lbs 14 oz) for the Amaruqs with Vertical FT bindings and leashes -- a huge savings especially considering that the Amaruqs had already been 200 g (7 oz) lighter than the K2 Mount Baker Superlights they had replaced. I picked the 182 cm Cho Oyu over the 174 cm because of its rockered tip, which makes the running length somewhat shorter than the traditional-camber 177 cm Amaruq, and the tail-to-heelpiece distance (important for easily skinning switchbacks if you're not tall) ended up slightly less than the Amaruq also. The listed "Area" is approximate, based on a simple 2-trapezoid formula, but gives a rough comparison of their flotation in powder. Dynafit Stoke, 182 cm, 130-106-122, 4420 g (9 lbs 5 oz) with Vertical ST bindings. Dynafit Cho Oyu, 182 cm, 125-89-111, 3530 g (7 lbs 12 oz) with Radical ST bindings. Volkl Amaruq, 177 cm, 127-88-109, 4030 g (8 lbs 14 oz) with Vertical FT bindings. Volkl Mountain N.Joos, 177 cm, 104-70-92, 3770 g (8 lbs 5 oz) with Comfort bindings. SYNOPSIS...THE REMAINS OF A WEAKENING FRONT WILL BRING MID AND HIGH CLOUDS TO MOUNT RAINIER NATIONAL PARK TONIGHT AND SUNDAY...BUT NO PRECIPITATION IS EXPECTED. AN UPPER RIDGE OVER THE PACIFIC NORTHWEST WILL STRENGTHEN AGAIN NEXT WEEK FOR MORE DRY WEATHER AND MILD CONDITIONS. SATURDAY...MOSTLY SUNNY. FREEZING LEVEL NEAR 11000 FEET. SATURDAY NIGHT...MOSTLY CLOUDY. FREEZING LEVEL NEAR 10500 FEET. SUNDAY...BREEZY. PARTLY SUNNY. FREEZING LEVEL NEAR 8000 FEET. SUNDAY NIGHT...PARTLY CLOUDY IN THE EVENING THEN BECOMING MOSTLY CLOUDY. FREEZING LEVEL NEAR 8000 FEET. MARTIN LUTHER KING JR DAY...PARTLY SUNNY. FREEZING LEVEL NEAR 10500 FEET. MONDAY NIGHT...PARTLY CLOUDY. FREEZING LEVEL NEAR 10500 FEET. TUESDAY...MOSTLY SUNNY. FREEZING LEVEL NEAR 9000 FEET. TUESDAY NIGHT...PARTLY CLOUDY. FREEZING LEVEL NEAR 9000 FEET. WEDNESDAY...MOSTLY SUNNY. FREEZING LEVEL NEAR 8500 FEET. WEDNESDAY NIGHT...PARTLY CLOUDY. FREEZING LEVEL NEAR 8500 FEET. THURSDAY NIGHT...PARTLY CLOUDY. FREEZING LEVEL NEAR 8000 FEET. FRIDAY...MOSTLY SUNNY. FREEZING LEVEL NEAR 7500 FEET. Time to get ready for another big trip and another big serving of summerlike corn on Martin Luther King Day. After the somewhat windier and cloudier weather over the weekend, the MLK holiday on Monday was forecast to be stellar once again, almost identical weather to January 16-17. Time to take my new skis out for a spin. 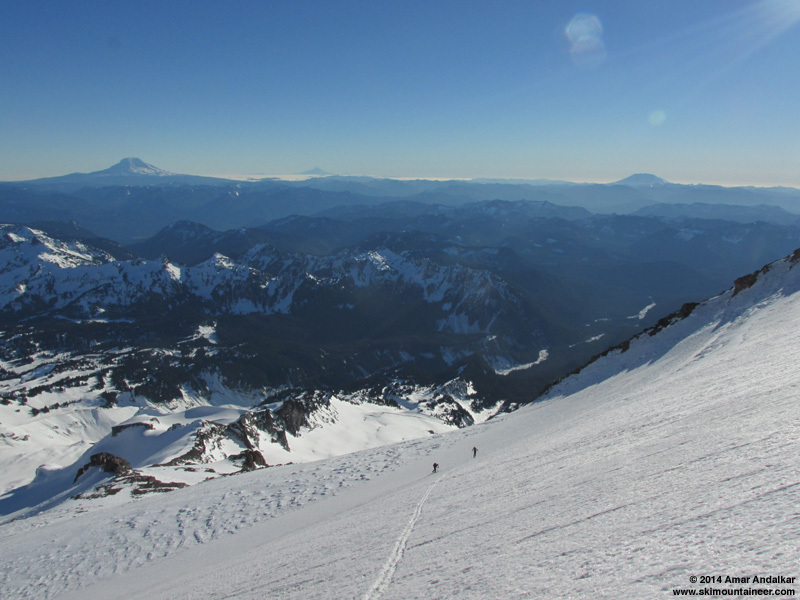 Paresh and Kane were already heading to Rainier, planning to ski the Nisqually Chute to bridge car-shuttle, and they asked me to join them. I convinced them to ski the Turtle and Van Trump route instead, and it worked out great again. Snow conditions were very similar to 4 days earlier, but notably icier in some areas and softer in others. 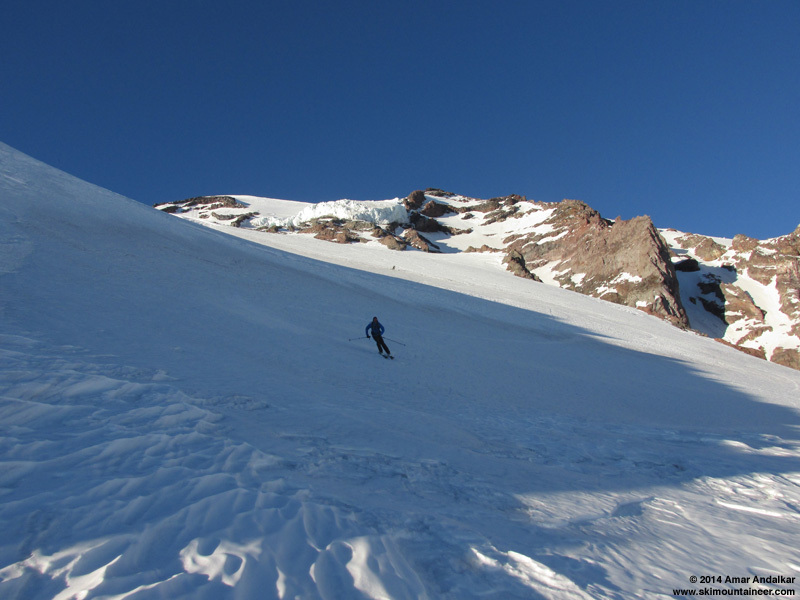 The snow on the Nisqually Glacier crossing in the morning was much firmer and icier after several more days of sun, and we all used ski crampons from 6800 ft at the base of Wilson Gully on up the rest of the day. The sketchy rising traverse from 7400-7700 ft on Wilson Glacier was icier too, and the previous skin track was partially filled with loose snow that had frozen in place, requiring the track to be re-stomped-in firmly with each step. Higher up though, the skinning conditions were in general better, more sun-softened and grippier even at almost exactly the same time of day. The skin up the Turtle from 9800 ft to the same 10500 ft spot was simple this time, not sketchy at all and fairly easy to put in a skin track like a highway in the well-softened corn at 3pm. 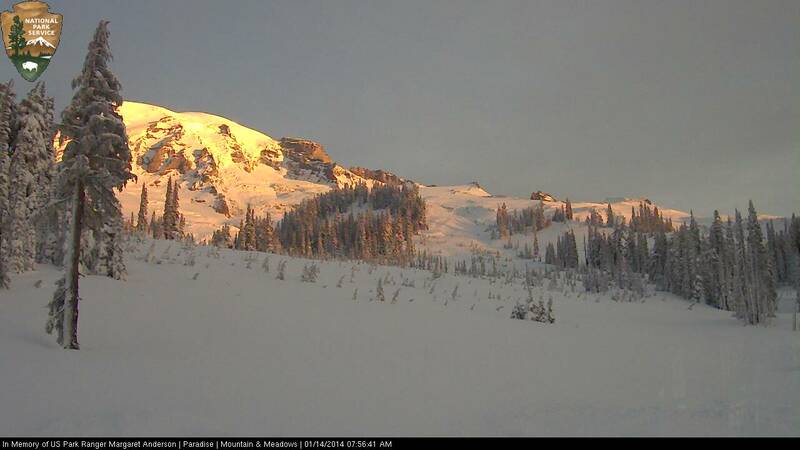 We topped out at 3:30pm, with temps in the mid 30s �F and a 10-15 mph westerly breeze on the ridge. Skied down just before 4pm, this time enjoying corn right from 10500 ft on down, especially in the sun, but refreezing already in the shade. Just stellar conditions, getting better with each warm sunny day. 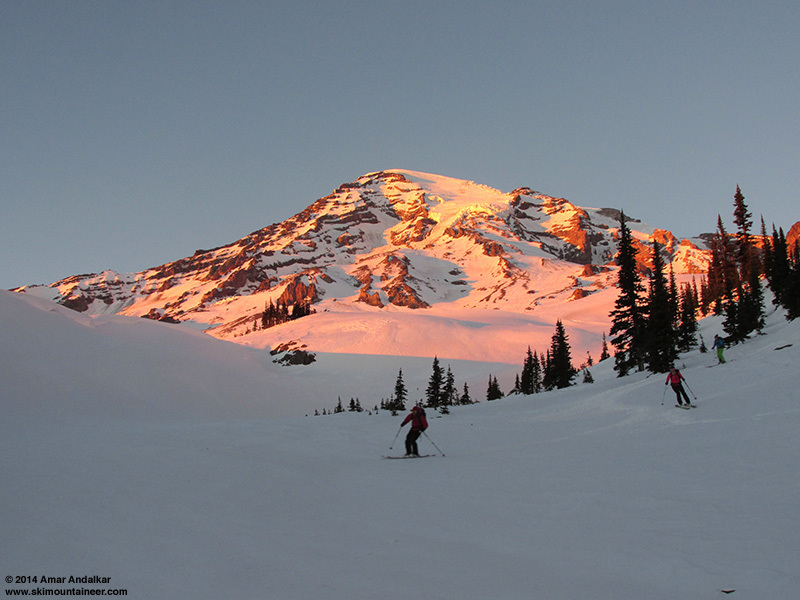 Once again we skied down in the golden glow of sunset, only a few minutes earlier than 4 days previously. 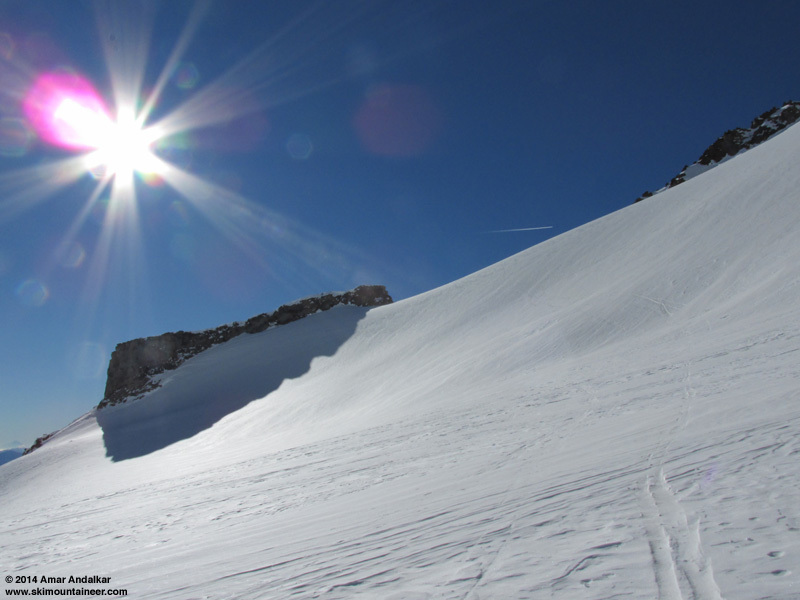 It appeared that no one else had skied this route since my previous descent on Thursday. The exit was even easier this time given that we had Thursday's tracks to follow, although snow conditions below treeline were once again crusty after sunset (no surprise). The ski down from the crest of the moraine was quite a bit easier this time -- maybe it was the new skis and the rockered tip working better in those conditions? Overall, the new skis worked great this day, light on the feet and skiing really well throughout the descent. Another quick schuss along the river, then skinning through the alders for a few minutes and back out to the bridge by headlamp once again, a bit after 5:30pm. SYNOPSIS...AN UPPER RIDGE WILL REMAIN OVER THE AREA THIS WEEK...WITH THE EXCEPTION OF TUESDAY NIGHT AND WEDNESDAY WHEN A WEAK UPPER LOW WILL BRING A CHANCE OF LIGHT PRECIPITATION. OTHERWISE DRY WEATHER WILL CONTINUE WITH SOME DAYTIME SUNSHINE AND MILD CONDITIONS. MONDAY...MOSTLY SUNNY. FREEZING LEVEL NEAR 10000 FEET. MONDAY NIGHT...MOSTLY CLEAR. FREEZING LEVEL NEAR 10000 FEET. TUESDAY...MOSTLY SUNNY. FREEZING LEVEL NEAR 10000 FEET. TUESDAY NIGHT...MOSTLY CLOUDY. A CHANCE OF RAIN AND SNOW AFTER MIDNIGHT. SNOW LEVEL NEAR 5500 FEET AFTER MIDNIGHT. FREEZING LEVEL NEAR 8500 FEET IN THE EVENING. WEDNESDAY...WINDY. MOSTLY CLOUDY. A CHANCE OF RAIN AND SNOW. SNOW LEVEL NEAR 4500 FEET. WEDNESDAY NIGHT...PARTLY CLOUDY. FREEZING LEVEL NEAR 5500 FEET. THURSDAY...MOSTLY SUNNY. FREEZING LEVEL NEAR 7000 FEET. THURSDAY NIGHT...PARTLY CLOUDY. FREEZING LEVEL NEAR 9000 FEET. FRIDAY...MOSTLY SUNNY. FREEZING LEVEL NEAR 10000 FEET. FRIDAY NIGHT...PARTLY CLOUDY. FREEZING LEVEL NEAR 10500 FEET. SATURDAY...MOSTLY SUNNY. FREEZING LEVEL NEAR 10500 FEET. SATURDAY NIGHT...PARTLY CLOUDY. FREEZING LEVEL NEAR 10500 FEET. SUNDAY...MOSTLY SUNNY. FREEZING LEVEL NEAR 10500 FEET. The Cho Oyu has been great so far -- probably the best ski-mountaineering ski I've ever owned, given the combination of ultralight plus surprisingly good performance. I'm rarely this enthusiastic about any ski, but maybe they just suit my skiing style really well too. And SO light! I've skied them 6 days so far during the first 8 days after I bought them, including 32,000 vert on 5 trips from Turtle or Muir to the bridge, plus taking them to Crystal and putting in 55,000 vert on the lifts to really get used to how they ski. Skied a wide range of conditions that day, mostly firm groomers and sun-softened ungroomed, plus some icy refreezing crust and other various bad snow that I sought out for testing in late afternoon as the shadows took over. They did well in all of that, edge hold was excellent and they'll carve a nice GS turn on firm groomers at 40-50 mph with no problem -- a real feat for such a featherweight ski, must be the carbon fiber in it. Really good torsional stiffness, but not very stiff flex overall. They do get deflected by frozen icy chunks, but that's inevitable given their lack of mass. 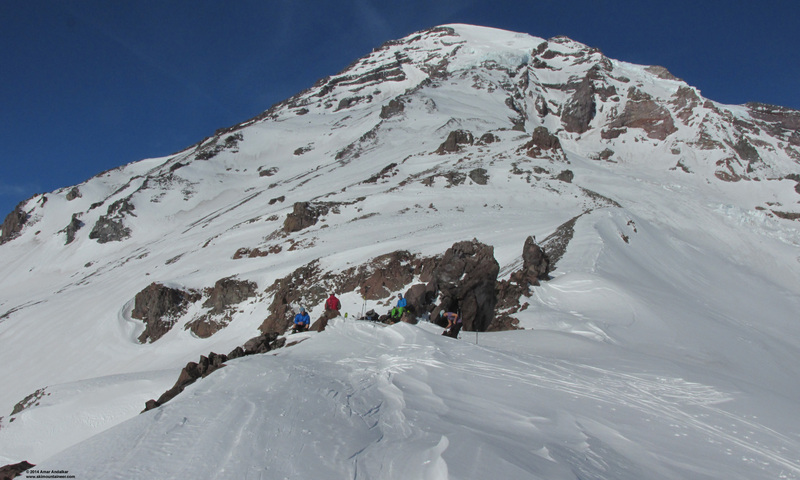 They've handled the few icy sections encountered during the Rainier trips just fine too. The rocker definitely makes them ski shorter than their overall length -- I'm glad I got the 182 instead of the 174, as the 182 has a much shorter running length than my 177 Volkl Amaraq (or any of my other several pairs of 177 skis). Despite almost identical tip-waist-tail dimensions to the Amaruq, they have more sidecut and a shorter radius due to their shape. Definitely noticeable while skiing, they carve a short radius turn much more easily than the Amaruqs will (I'm not a fan of short radius turns as you may know, I really prefer to make big sweeping turns, but it is nice to have the capability when needed in tight spots). SYNOPSIS...AN UPPER RIDGE OVER THE AREA WILL SHIFT EAST TUESDAY. A WEAKENING LOW PRESSURE TROUGH WILL CROSS THE REGION TUESDAY NIGHT. AN UPPER LEVEL RIDGE WILL REBUILD OFF THE COAST ON WEDNESDAY AND SHIFT OVER WESTERN WASHINGTON ON FRIDAY WITH LOW LEVEL OFFSHORE FLOW DEVELOPING. THE PATTERN WILL REMAIN LITTLE CHANGED THROUGH THE WEEKEND. TUESDAY NIGHT...PARTLY CLOUDY IN THE EVENING...THEN MOSTLY CLOUDY WITH A CHANCE OF LIGHT RAIN OR SNOW AFTER MIDNIGHT. SNOW LEVEL LOWERING NEAR 5500 FEET AFTER MIDNIGHT. WEDNESDAY...MOSTLY CLOUDY. A CHANCE OF LIGHT RAIN AND SNOW IN THE MORNING. SNOW LEVEL NEAR 4500 FEET. WEDNESDAY NIGHT...PARTLY CLOUDY. FREEZING LEVEL NEAR 6500 FEET. THURSDAY...SUNNY. FREEZING LEVEL NEAR 7500 FEET INCREASING TO 10000 FEET IN THE AFTERNOON. FRIDAY THROUGH SUNDAY...SUNNY DAYS AND MOSTLY CLEAR NIGHTS. FREEZING LEVEL NEAR 12000 FEET. SUNDAY NIGHT...PARTLY CLOUDY. FREEZING LEVEL NEAR 11000 FEET. MONDAY...MOSTLY CLOUDY. A CHANCE OF RAIN AND SNOW LATE. 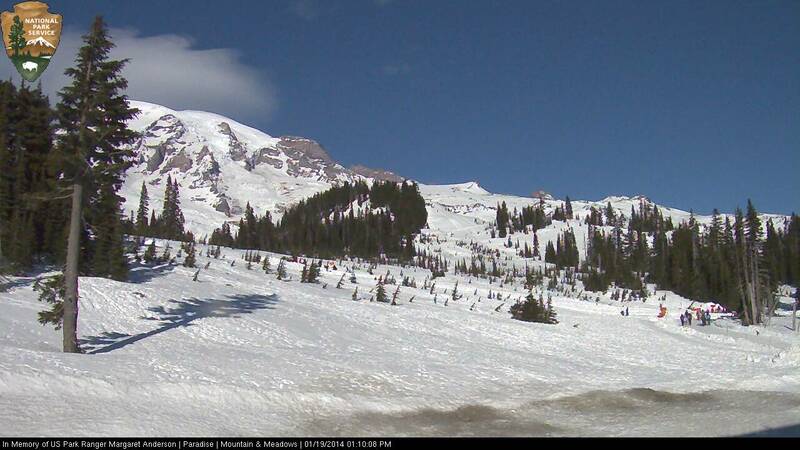 SNOW LEVEL NEAR 8500 FEET. Wednesday, January 22, was forecast to be the worst weather day of the entire period of extended high pressure, as a small weak upper-level low fought through the persistent ridge and arced southeastward through the region, dropping snow levels to 4500 ft overnight into the morning, with mostly cloudy conditions and a chance of light snow. A good day for a rest day as Juneuary was rudely interrupted by a tiny bit of January. Amar - I admit the skiing was quite decent, very nice corn the last two days I skied on the southerly type aspects. 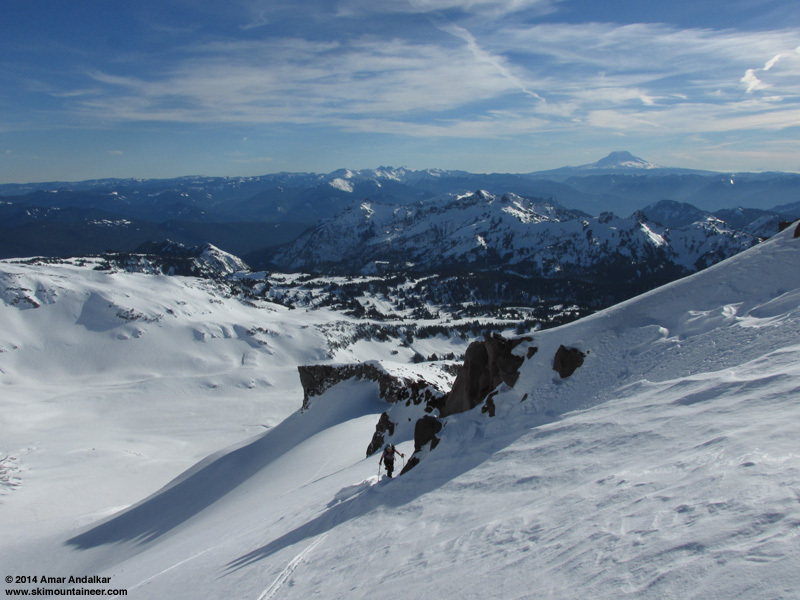 However, I am not going to rave about it since this is the time of the year when we should be ghost skiing, hat skiing or at least here in the Northwest getting the occasional face shot and building a decent snowpack for our water inventory. 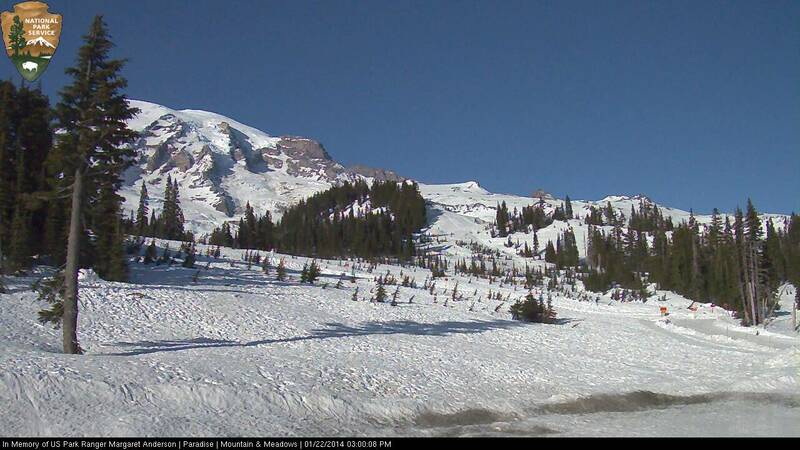 The mountain looks like it normally does in September up high and the snow pack is a joke in most places here in the PNW. We are better than California, but that is about all we can say. 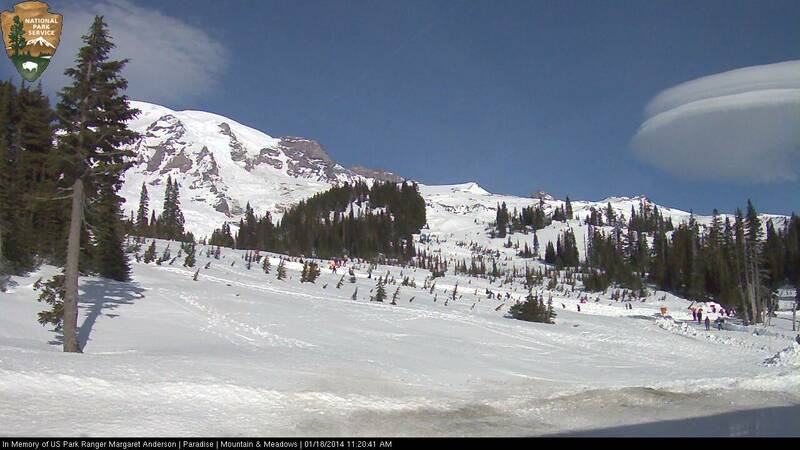 This is the second worst ski season so far in my 50 years. Thankfully with the AT gear you can, like you say find nice turning snow. It is what it is you just got to take what nature gives you and make the best of it, but there has been a huge change in the Januarys since I first started skiing in 1962. Even in big snow years January has not in recent years kicked out many big days. I would love to be in the trees any day dodging avalanches and working the white room in January rather than thinking I was at Mammoth Mountain in April. There is one big plus there were tons of ladies in halter tops climbing up Pan Point on their way to the Nisqually now that really adds to the scenery.....LOL. Anyway keep posting your pictures are awesome! you sure are getting after it Amar, love it ! Nice meeting you up there, Amar, and thanks for all of the pictures. 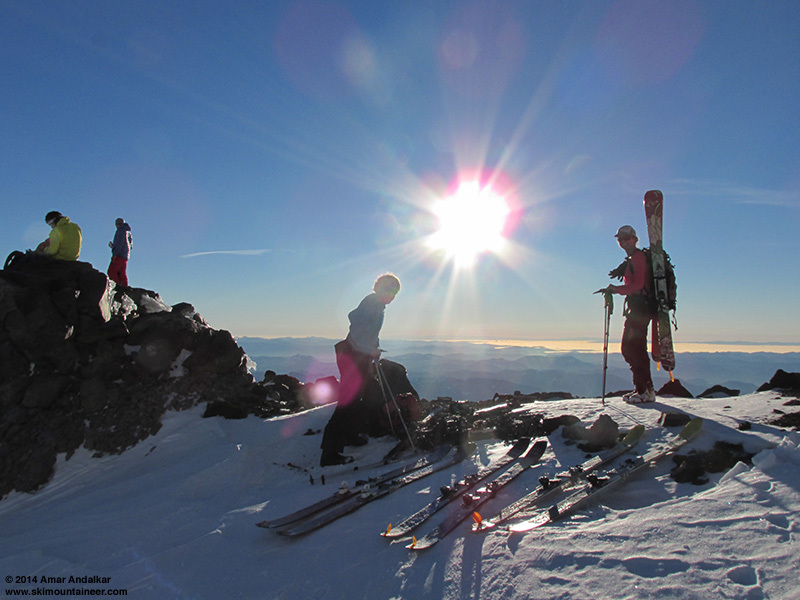 It was a terrific day to ski up there on Friday. I am glad I ran into you and the others. Thanks again for the car shuttle from the bridge. Amar - I admit the skiing was quite decent, very nice corn the last two days I skied on the southerly type aspects.� � However, I am not going to rave about it since this is the time of the year when we should be ghost skiing, hat skiing or at least here in the Northwest getting the occasional face shot and building a decent snowpack for our water inventory. The mountain looks like it normally does in September up high and the snow pack is a joke in most places here in the PNW.� We are better than California, but that is about all we can say.� This is the second worst ski season so far in my 50 years.� Thankfully with the AT gear you can, like you say find nice turning snow. It is what it is you just got to take what nature gives you and make the best of it, but there has been a huge change in the Januarys since I first started skiing in 1962.� Even in big snow years January has not in recent years kicked out many big days.� I would love to be in the trees any day dodging avalanches and working the white room in January rather than thinking I was at Mammoth Mountain in April.� There is one big plus there were tons of ladies in halter tops climbing up Pan Point on their way to the Nisqually now that really adds to the scenery.....LOL. What exactly is the 'turtle'? is that the aspect just east of Van Trump where one might slide right back into Nisqually? I owe Amar (and Kamtron) thanks for the ride back to my rig at Paradise on Friday the 17th. My solo day was much improved by meeting you guys and skiing to the bridge! Also, thanks for the photo credit above. I made a silly gif of Amar making turns down the chute that day. What exactly is the 'turtle'?� is that the aspect just east of Van Trump where one might slide right back into Nisqually? 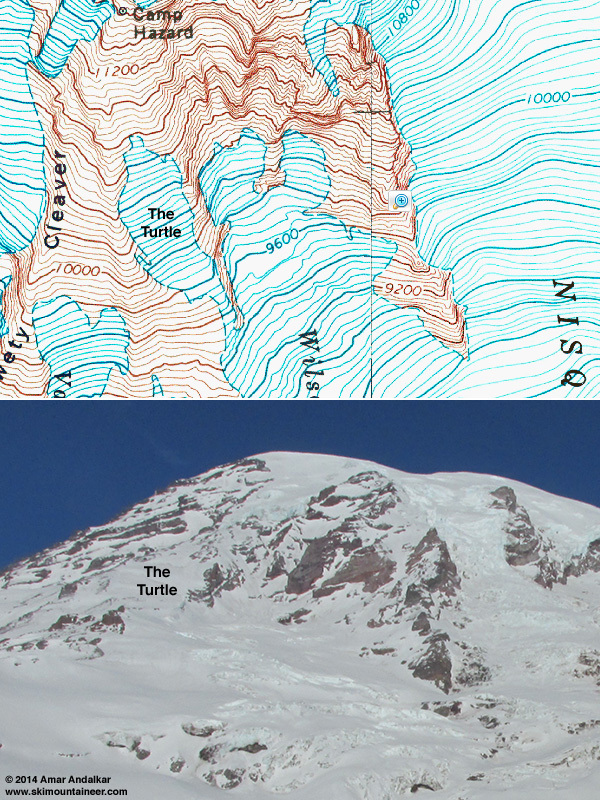 The Turtle is a glacial remnant above the Van Trump Glaciers, adjacent to Wilson Glacier, and below the Kautz Ice Cliff and Camp Hazard, extending from 9800 ft up to about 10800 ft. It's often mistakenly referred to as a snowfield, but is a real chunk of glacier with a few small crevasses when it melts out to bare blue glacial ice in the summer, just like the upper portion of the Muir "Snowfield" (which is also a glacier) does most years by September. Thanks Amar. I've also often wondered if there are any approaches to the VanTrump area from the current Nisqually terminus area and below. 5800 feet? can i go up where you exited? This also avoided the potentially serious hazard of falling bodies on Pan Face, which can be a significant risk on busy days with firm frozen conditions in the morning. ... this was after our close call with a snowshoer a few weeks before. Body traveling at terminal velocity, flailing ice axe, massive picket on pack---yikes! Amar - Thanks for the fantastic photos and thorough detail on your TRs. They're a joy to read! do you work? way to get some!